You never know quite what to expect when cruising. You read the guidebooks, talk to other cruisers, think you know what a place is going to be like, but it's never quite how you imagine it. And that's a good part of the appeal of cruising, of any form of travel really. If words and photos and video were sufficient to really experience what any given place is like, why go to all the trouble of traveling there? I was prepared to breeze by St. Lucia. An early plan for this season had us spending 5 days, and at one point we considered skipping it altogether in the interest of saving ourselves two vet visits for Piper. There were a couple reasons I wasn't stoked. I knew there was a fair amount of charter boat traffic, and heard their tourism was largely geared to all-inclusive resorts and cruise ships, and I saw the reports of petty theft and even violent crime on the Caribbean Safety and Security Net website, and read online cruisers bitching about pushy boat boys. So the hassles seemed to outweigh the attractions, because I didn't really know the attractions. As it turned out, we ended up staying 14 days and loving it. Mind you, I was gone on a work trip for 4 of the 14 days, which was our whole reason for coming to St. Lucia in the first place. It's not that easy to fly from Martinique or St. Vincent to my base airport of Atlanta, while my employer has daily flights from St. Lucia. And Rodney Bay Marina has a reputation for being nice while also being remarkably cheap. 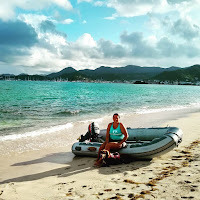 So we crossed from Saint Anne, Martinique to Rodney Bay on Tuesday, March 19th. 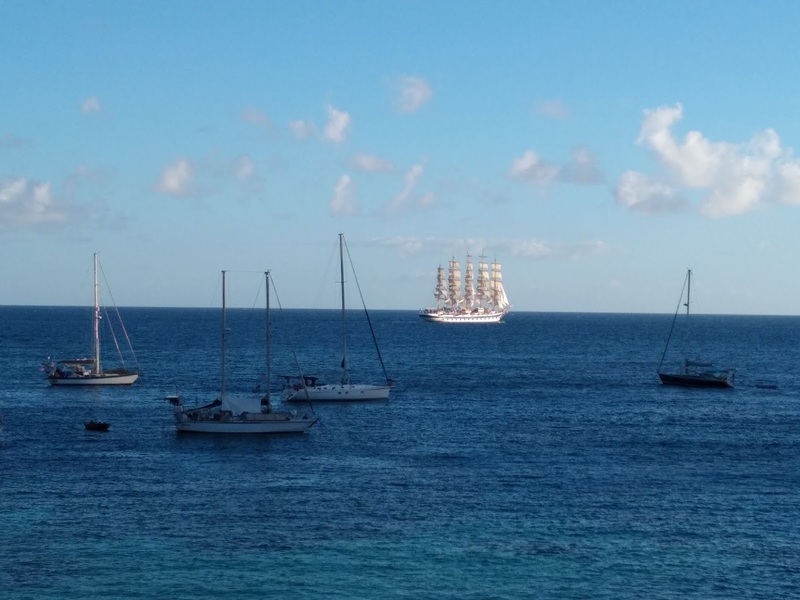 We sailed all the way to the anchorage, beating past the beautiful Sea Cloud II sailing cruise ship. 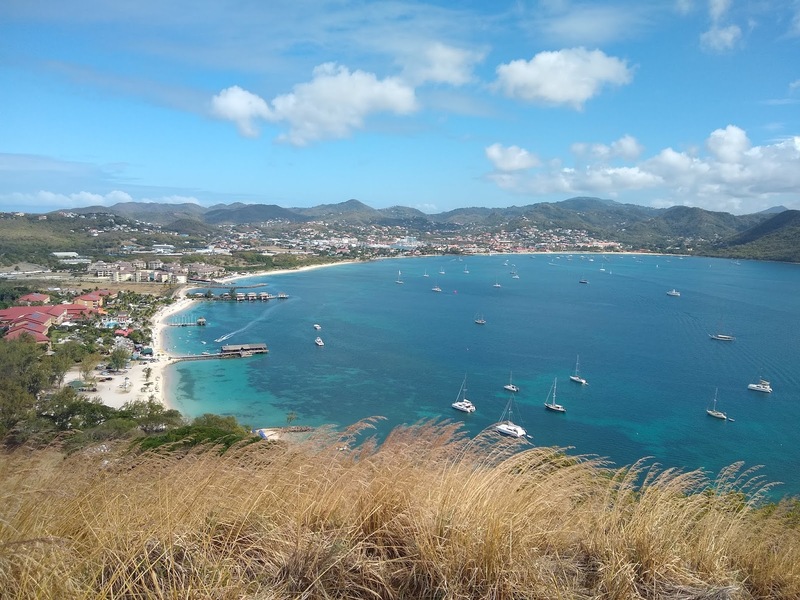 Rodney Bay has gorgeous water, great beaches including some Piper-friendly spots, a nice national park with good hiking on one end at Pigeon Island, and a cruiser-friendly dinghy dock at the marina with lots of good dining, drinking and provisioning spots around. What's not to like? Crime, that's what. 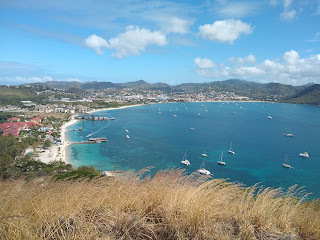 Rodney Bay has a reputation for petty theft in general, dinghy theft in particular, and even occasional boat boardings, reportedly originating from the local town of Gros Islet. And indeed, our second night in the anchorage there was a dinghy theft that was announced on the VHF net the next morning (and soon made its way to Facebook and the CSSN website). The particulars are interesting. The dinghy was secured to the mother ship, but the thief(s) were well-prepared with a bolt-cutters. The fact that the dinghy was left in the water and had a thin security cable rather than a chain made their job considerably easier. When Dawn and I were in Antigua, we purchased a 10' section of beefy 10mm BBB chain and several additional padlocks, and revamped our security procedures before heading south. We padlocked one end of the chain to a hard point on the dinghy and, before leaving it unattended, padlock the other end to a hard point on the dock. An additional cable secures our gas tank and ties in with the padlock that secures our outboard engine to the transom of the dinghy. At night, we raise the dinghy on our davits, and lock it to our stainless railing. We also raise our boarding ladder and close the lifeline gate. Does this make us impregnable? Of course not. If somebody really wanted to get aboard, silence our wildly barking dog (arguably our best security measure), hold us at knifepoint, and steal most of our earthly possessions, they probably could (more likely scenario, they wait until we and Piper are gone, and break through the teak of the locked companionway hatch). But the point to all this isn't to make us impregnable, just to make us a harder nut to crack than the newer and fancier boat anchored right next door. I'm confident we are, so I don't worry about security too much. Except when I'm at work. Because if anyone's paying attention, it'd be quickly apparent that I'm not onboard, and that could get some wheels turning in an undesired direction. And it's really hard for Dawn to get the dinghy on the davits by herself, which removes another protection. So far this season we haven't had to really worry, as I left her on the dock in Puerto Rico and St. Thomas, and the lagoon in St. Maarten and Falmouth Harbour in Antigua are both pretty safe. But in Rodney Bay I had to err on the side of caution. Fortunately the Rodney Bay Marina has fantastic floating docks and nice facilities at only US$.70/ft/day. That's the price of a mooring ball in the BVI. So it made for an easy choice. The day that I flew to Atlanta, we rented a car and took Piper to his vet appointment in the hills east of Castries to get his health certificate to go to St. Vincent and the Grenadines. Then we drove cross-country to the east coast on small local roads, marveling at the sturdy houses splayed up and down the hillsides. St. Lucia was wealthier than I expected, with bigger houses and cleaner yards than seen in anglophone islands further north. We ate at a great local open-air restaurant on the east coast, Chill-n-Grill, before Dawn dropped me off at the airport. When I got back 4 days later (landing currency newly reset), I split a $100 cab fare with a nice young couple from Birmingham, AL that was going to a resort just north of Rodney Bay. While on the dock, I chose to have some local guys, Albi and Elvis, detail & wax Windbird (her bootstripe was quite faded and needed some restoration), and repair various dings in her gelcoat, $300 all-in. They worked wonders with the green bootstripe and waterline stripe, and overall she looks way better, but the gelcoat repairs were fairly amateurish. Which is to say, probably about the same as if I'd attempted them myself. In the guys' defense, they worked quite a few extra hours to try to make it right (only partially succeeding) and didn't try to get me to pay more than the initial quote. Because of the extra time to finish the work, we got off the dock a day later than planned (two days after my return from Atlanta). 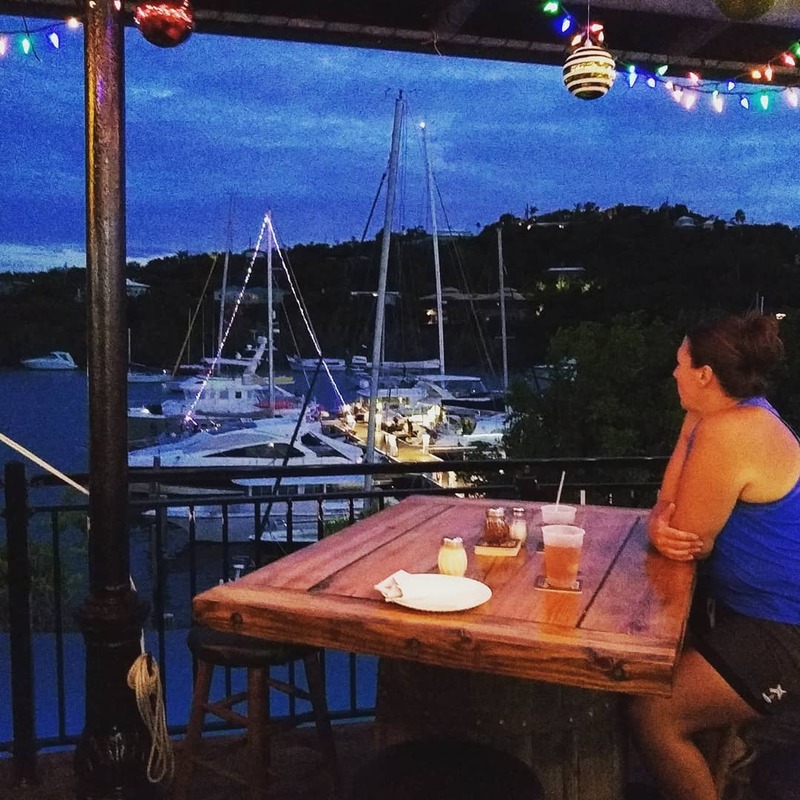 In retrospect, taking the dock may have been the wrong move, for as soon as we got to Marigot Bay, Dawn fell in love with the place. Imagine a perfectly protected azure lagoon, surrounded by green hills and mangroves filled with birdsong on three sides and enclosed on the ocean side by a sandy spit straight out of a Corona commercial, right down to the tall swaying palm trees. Add a five star resort with two gorgeous pools, to which your $30 mooring fee gets you free access (plus showers and fast wifi). Add several friendly, lively cruisers bars around the lagoon and a couple of local joints up the hillside. We were planning to spend one night but immediately decided on two, and probably could have stayed a week. That resort pool was absolutely heavenly. 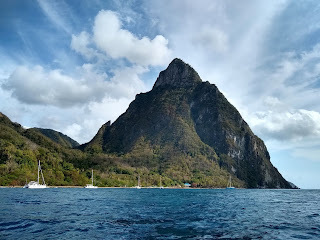 We knew Souffriere would be more rough-edged, with a history of theft against yachts, and so decided to take a mooring ball (mandated by national park regulations) between town and the Pitons. 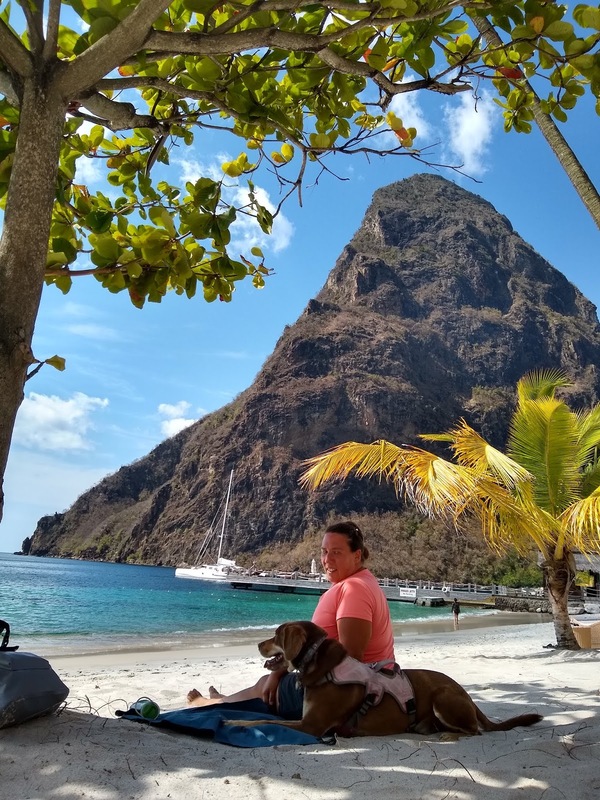 In fact, we thought the town wasn't that bad, and certainly has a good deal to offer cruisers, and were completely blown away by the mystical beauty of the Pitons. Our anchorage below Petit Piton was one of the most spectacular of the season, made even better by the nearness of a very Piper-friendly beach with easy dinghy landing. 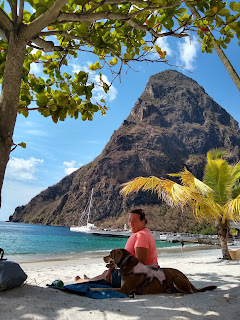 We only had two nights due to an April 1st appointment with the government vet in St. Vincent; we were sorely tempted to spend a third but would have had to cancel and reschedule last-minute, since we couldn't reach the vet over the weekend. 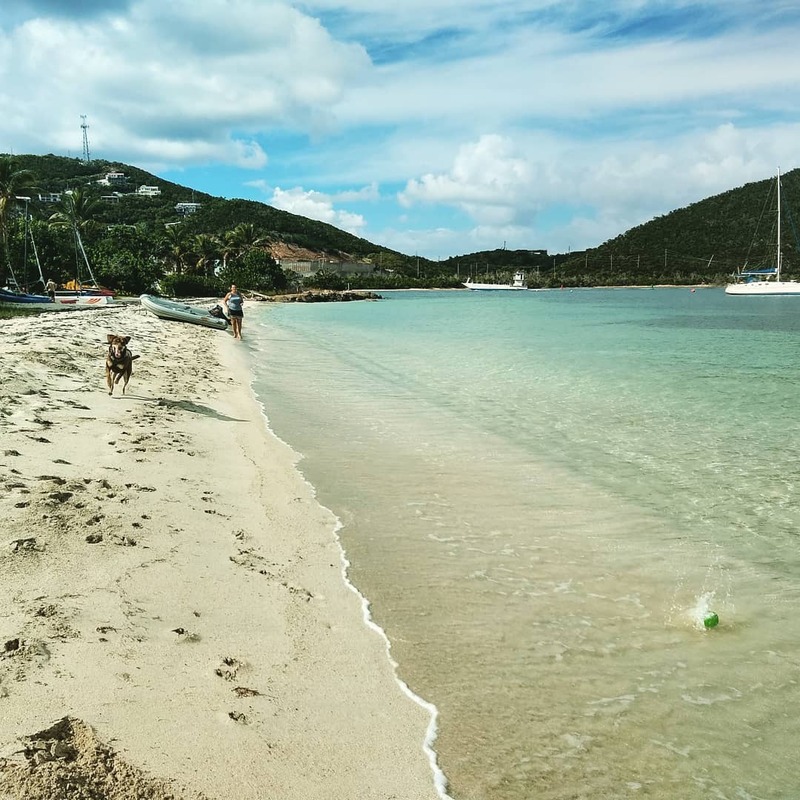 SVG is one of the most notoriously difficult places for cruisers to import dogs, so we decided to stick to the original schedule. This meant that we didn't get to climb either of the Pitons. Instead we did a half-day tour, booked through "our" boat boy (i.e. the first one that met us, a good 3 miles out of town). It was a bit disappointing for what we paid (230 ECD, "reduced" from an initial quote of 300), mainly because the taxi driver rushed us through and the "half-day" lasted a bit over 2 hours. We toured the Souffriere volcano, which is small but pretty neat with a bunch of smoking fumaroles and bubbling mud pits, and then we visited the Black Water Pools. Dawn declined to do this bit as she hates getting dirty, which in my opinion was a real mistake. You dip in jet-black hot mineral water, emerge to smear yourself with gritty, nutrient-rich volcanic mud, let yourself bake dry in the sun, plunge into the water, and repeat. Or at least repeat if you don't have an insistent taxi driver hurrying you along to a small and fairly chintzy touristified waterfall. At least he was willing to finally drop us off at the Diamond Estate botanical garden & mineral baths, which was a really cool spot not on the tour. From there we walked back to town along a pleasant shaded lane. I was a little disappointed over the tour, but I gotta say that I felt pretty awesome after my mud bath. 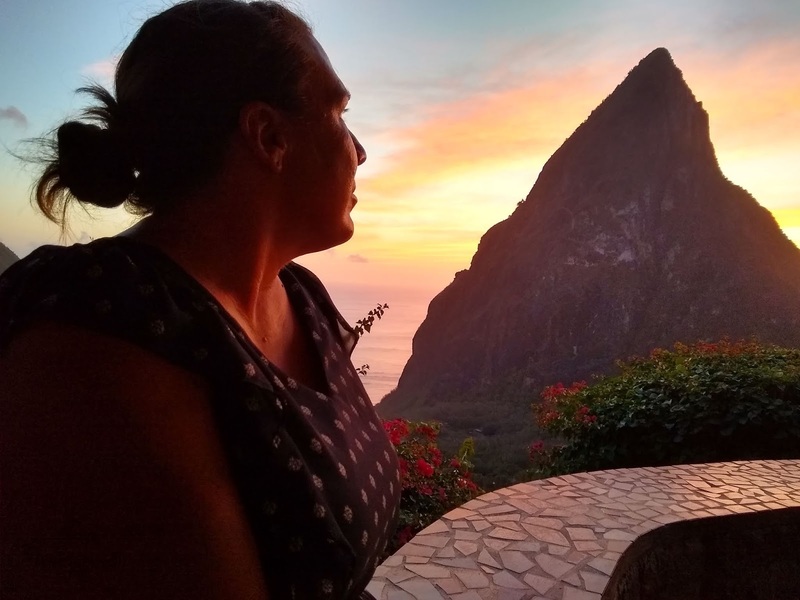 I had decided to end our stay in St. Lucia with something really special. 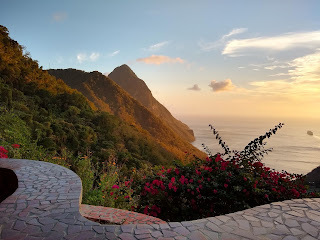 I made a 6:30 dinner reservations with Dasheen Restaurant at Ladera Resort, and we dressed up and took a taxi up the mountain at 5pm to have a few drinks and watch the sunset before dinner. Wow, what an absolutely magical, tranquil place with an utterly spectacular view of the Pitons. The signature cocktails were amazingly good, the slanting light was beautiful, the music and the mood and the attentive waitstaff just perfect. And that was just cocktail hour! As the Pitons faded in the dusk, we were ushered up two terraces to our table for two. Our waitress was super nice, the meal was fantastic, and even the live entertainment - an older local lady softly strumming the guitar in a corner and crooning a mix of eclectic covers and originals - was spot-on for the mood of the evening. It was one of our most memorable outings in a long time. Obviously, this is a splurge we can't afford to do very often (by my estimate, it cost 1.35 flight hours! ), but it was the perfect end to our stay at a beautiful island that surprised us with its charms. Dawn may have felt like a queen for a few hours, but when you live on a sailboat, reality is never that far from crashing on in. Soon after we returned, we got soaked while landing our long-suffering pup on a pitch-black beach in crashing surf. About five hours later, we awoke at 2:30am for a 3am departure to St. Vincent. And so it goes. Ok, this being constantly behind really isn't working, I'm going to speed up our trip through the West Indies the last six weeks! At the beginning of February, my parents (Dave & Sue) flew into St. Maarten, one day later than planned due to a family friend's funeral at which my dad (who is a pastor) officiated. 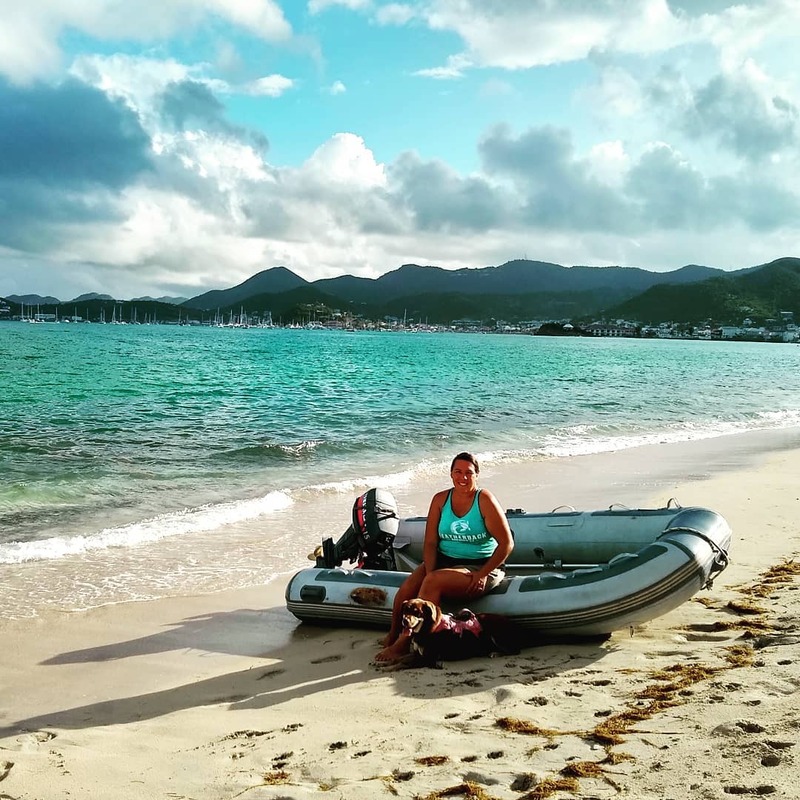 I met them at the airport, rode the $1 bus to the dinghy dock bar, whisked them via dinghy to the customs dock, checked them (and us) out of Sint Maarten, and within an hour of their landing were underway to Ile Forchue, an uninhabited island just west of St. Barth. 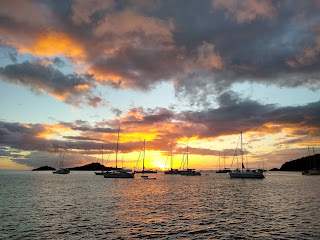 The next day, Dawn's birthday, we had a lovely hour-long sail to Gustavia (St. Barth), met up with our good friends Kara and Erin on S/V Vela, and spent the day exploring Gustavia, hanging out on Shell Beach, and celebrating Dawn's birthday at an Italian restaurant. We also ran into Dave, Erin and kids on S/V Roam at famed sailor bar Le Select. The next day mom and Dad and Dawn and I rented scooters and thoroughly explored the island, which we loved. 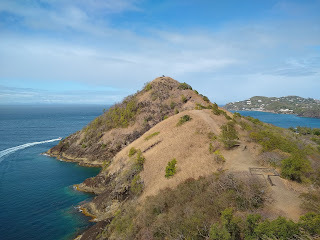 That night we motored over to beautiful Anse du Colombier, where we rejoined Vela and then spent the next day hiking and snorkeling. 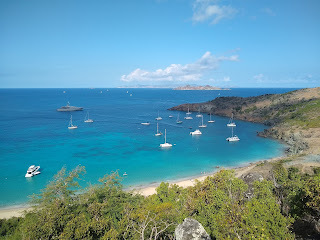 After a relaxing second day in Anse du Colombier, we set sail for an overnight run to Antigua, which was mostly a pleasant motorsail in light northeasterlies (we did get in about 4 hours of sailing when the wind got up to 8 knots - which we never would have been able to sail in before the new prop). 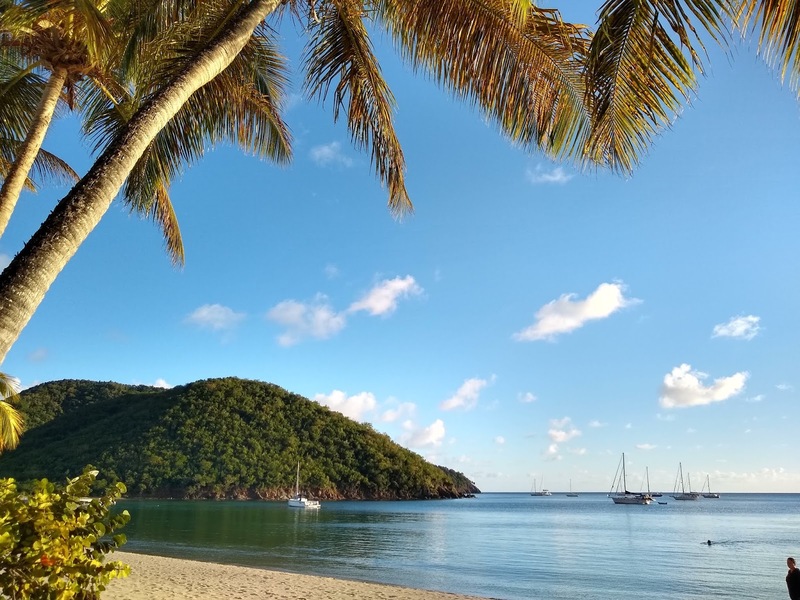 We spent one night in Jolly Harbour, where we ran into friends Bob and Margo on S/V Ivory Star, and spent another in gorgeous Carlisle Bay. We snorkeled there and dinghied to the exclusive hotel for some rather pricey cocktails and a stunning $1000/night view. 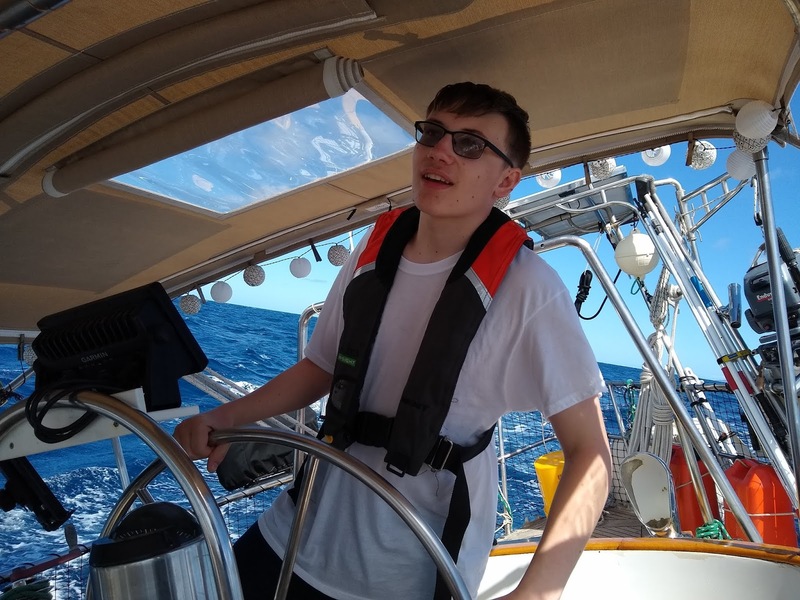 The next day we motored a few miles east to Falmouth Harbour, where we anchored close behind YouTube star boat S/V Delos. Later that day we actually ran into Brian and Karin outside the supermarket and talked to them for a little bit (we later talked a bit when anchored next to them at Green Island, and we met Brady and Alex the night they flew back in from snowboarding in CA - all very nice folks). 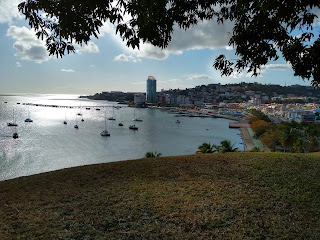 We explored the very cool restored Nelson's Dockyard and then took a taxi up to Shirley Heights. 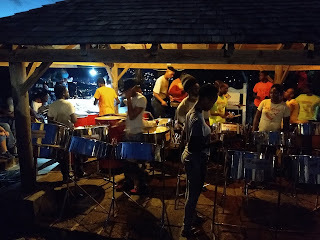 This being Sunday, there was a fantastic steel pan band playing and excellent West Indian BBQ was on offer, both of which we enjoyed to the accompaniment of a really spectacular sunset. 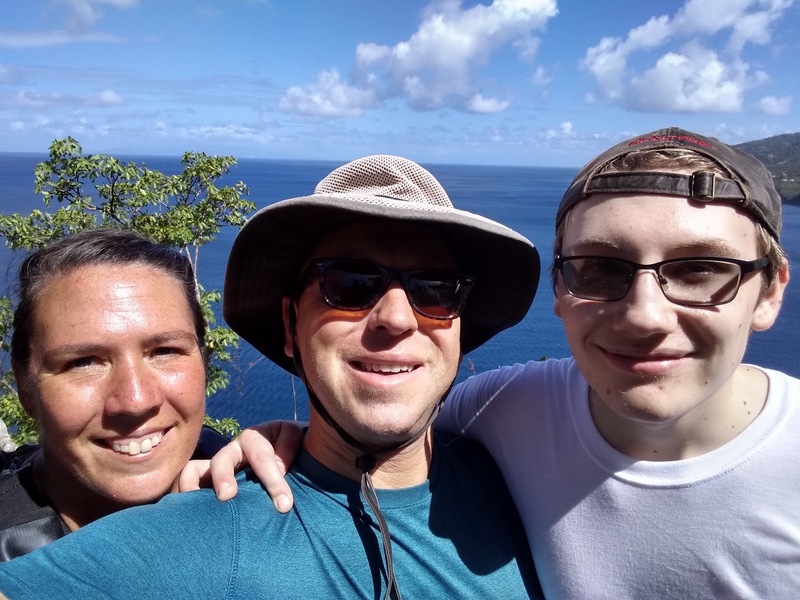 On Monday we rented a car and drove all over the island, getting a few practical things done along the way (including commissioning Marine Power Systems to fabricate a mounting bracket for our second alternator). 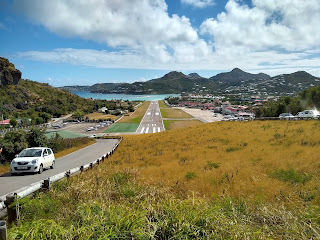 On Tuesday, Dawn drove Mom, Dad and I to the airport, where we all flew on a WinAir Twin Otter to SXM (St. Maarten), hung out on Maho Beach for a couple hours, and boarded our flight to Atlanta. There we said goodbye as Mom and Dad headed back to snowy Minnesota and I started a 4-day work trip to Rio de Janiero. 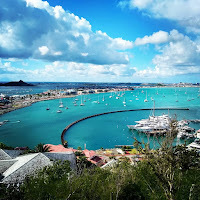 After the trip was done, I flew back direct to Antigua (my airline flies direct once a week) and arrived back to a Falmouth Harbour that was abuzz with preparations for the Caribbean 600. We actually took Windbird out to near the start line to watch the start (which was a bit hectic in 20-23 kt wind and 7-8-foot seas) and then beat our way over to Green Island, which is a fantastic anchorage tucked behind a protecting reef (much like Ensenada Dakity in Culebra). 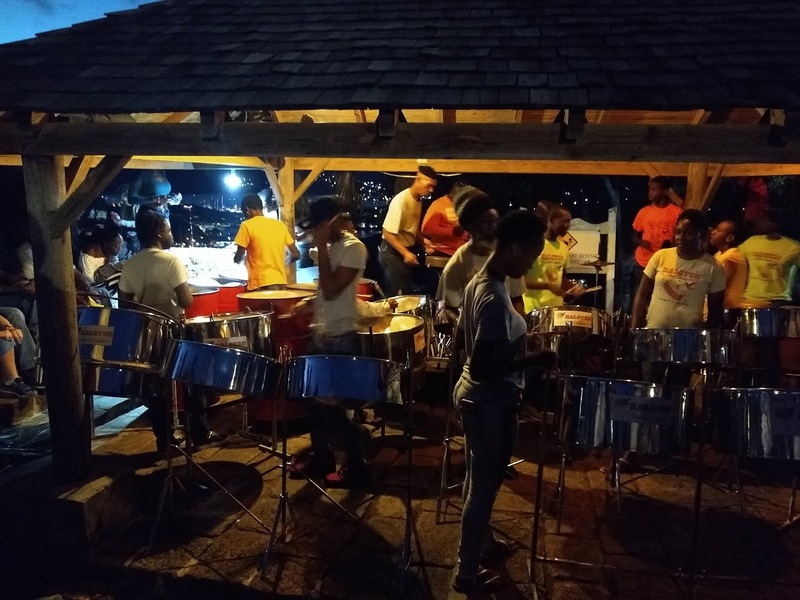 After a few nights there we moved down to Mamora Bay, and the next day back to Falmouth. For a while it looked like we'd be delayed due to weather (and our next guests would have to fend for themselves for a few days) but then the forecast improved. 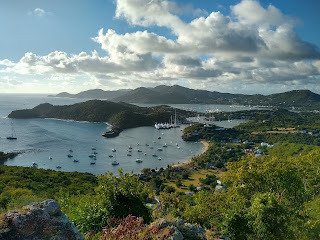 We did Shirley Heights again that Thursday, collected the finished alternator bracket, attended the Caribbean 600 final party, got Piper's health certificate for Dominica, and sailed out of Falmouth Harbor on Feb 23rd, capping a fantastic 16 days in Antigua. It was a lively beam-to-broad reach to Guadeloupe in big seas, to which we were rapidly becoming re-accustomed. 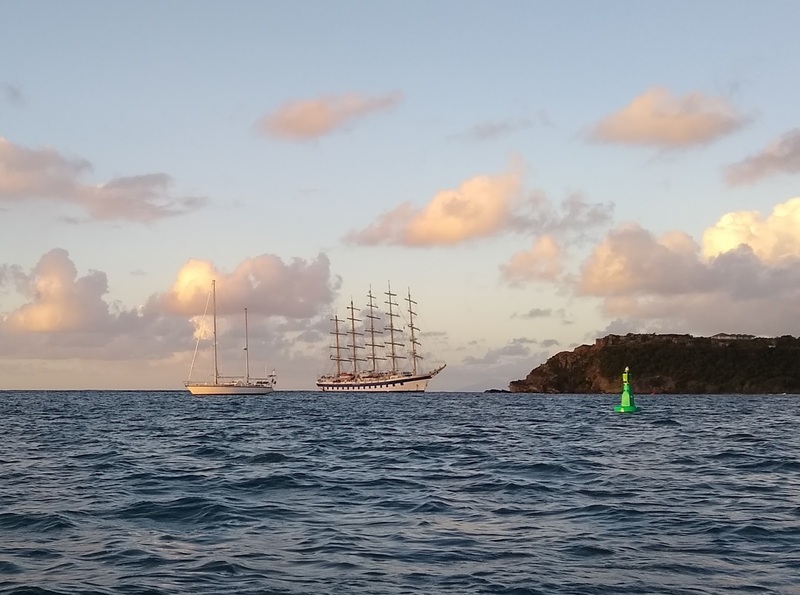 Since our crossing from St. Barth to Antigua, I don't think we've sailed in anything less than 15 knots of wind, and most crossings have seen 20 kts or better. We've kept two reefs in the main and have mostly enjoyed the ride and especially the stellar boat speeds. 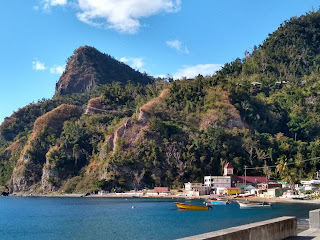 Deshaies is a very pleasant, quiet little fishing village with just a little (mostly French) tourism, which turned out to be a good introduction to Guadeloupe, which is very French. I love France, so that's a good thing, but the language barrier did occasionally prove greater than anticipated. My longtime friends Lori and Kelly (who are fraternal twins) and their husbands Rob and Rob (yep) flew in on Sunday, arriving after dark. 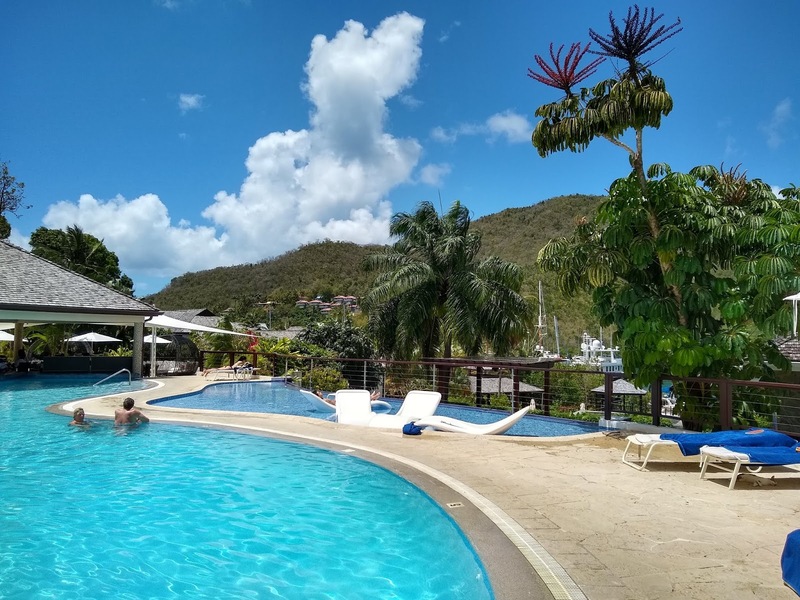 We've never had six adults stay on Windbird before, so the twins and the Robs rented a seaside apartment in Deshaies for the first three nights - that turned out to be the perfect arrangement. 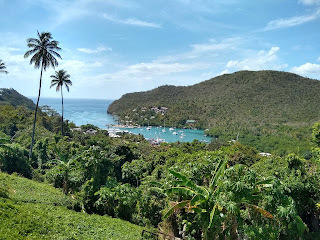 The next day, we all piled into their rented minivan and headed to the really wonderful botanical garden above Deshaies (which Howard and Doris on S/V Safara had told us about), and afterward rock-hopped up the Deshaies River. The next day we drove a big ring around the south side of Basse Terre, stopping at several waterfalls and beaches along the way and enjoying a scrumptious creole lunch at le Tepic in Capesterre. 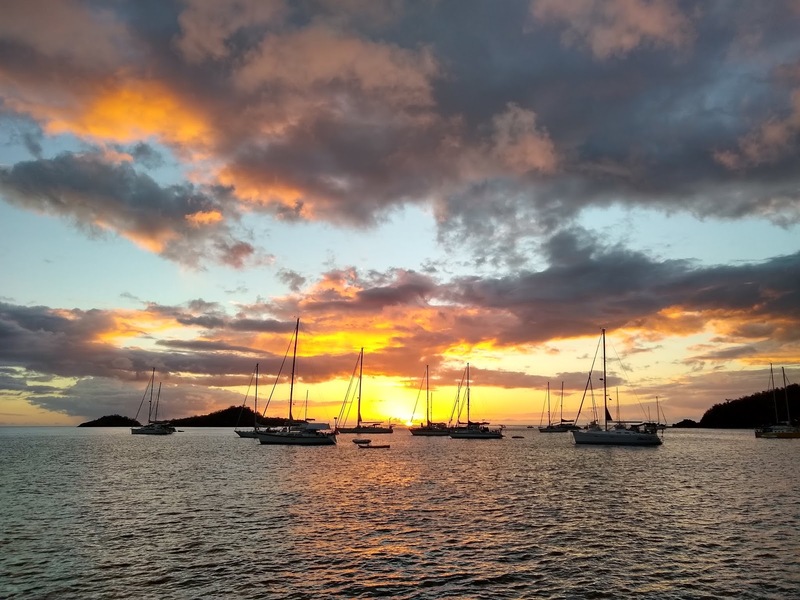 On the 27th we sailed down the coast to Pigeon Cay (best snorkeling of the season so far in the Jaques Cousteau marine park, but also the rolliest anchorage of the season), and continued on to the Saintes on the 28th. 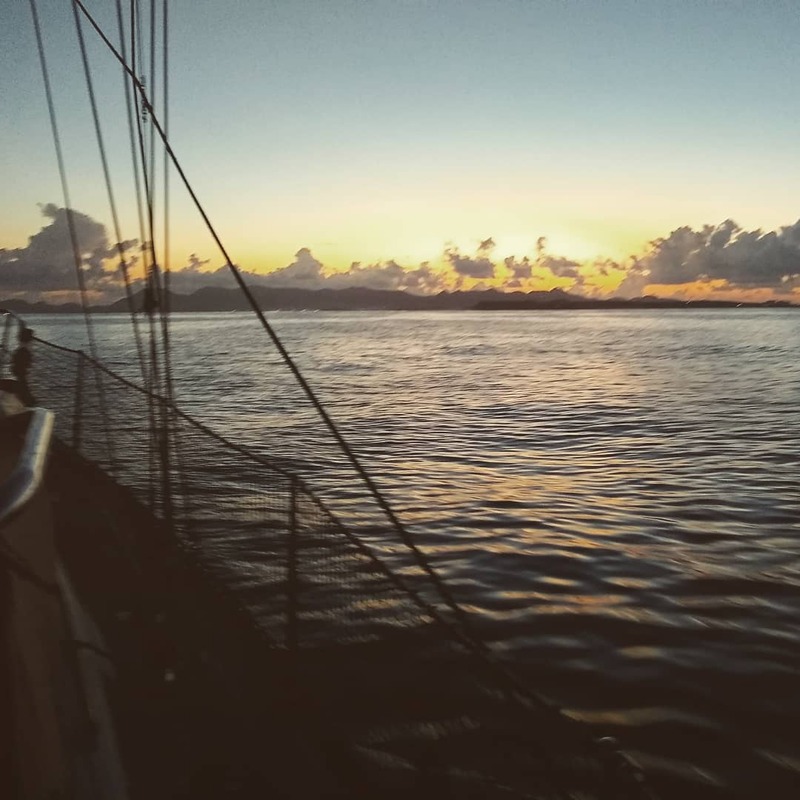 The mooring fields were all shockingly full, and after trying five of them we were reduced to anchoring around the corner at Terre-de-Bas' Grande Baie, which turned out to be the perfect secluded anchorage for that night. The next morning we headed back to Terre-de-Haut and scored a perfect spot in front of town. The Saintes were as spectacular as we'd hoped, and our guests loved them too - we could barely get them on the ferry to Pointe-a-Pitre! We would have liked to stay longer, but our next weather window was about to close for up to a week, so we bade a fond farewell to Guadeloupe on Sun, Mar 3rd. 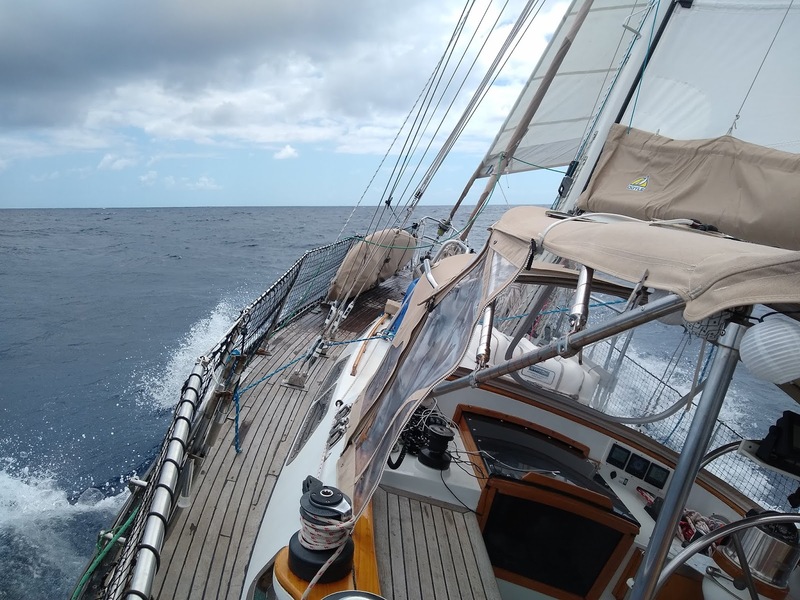 Our close reach from the Saints to Dominica will likely qualify as the bash of the season, taking place in 17-20 kts gusting to 23 and steep, choppy 6-7' seas - but even in this, with double-reefed main and yankee, keeping the boat low and powered up at 45 degrees apparent, we were able to maintain about 5.5 knots boatspeed. Thankfully Portsmouth proved to be a very rainy anchorage, because there was a lot of salt to wash off! We took a mooring in Portsmouth, assisted by P.A.Y.S. member Lawrence of Arabia, who per local custom then became our designated contact point for tours, supplies, and anything else we needed while in Portsmouth. It's a decent system, one far more organized than the boat boys further south. 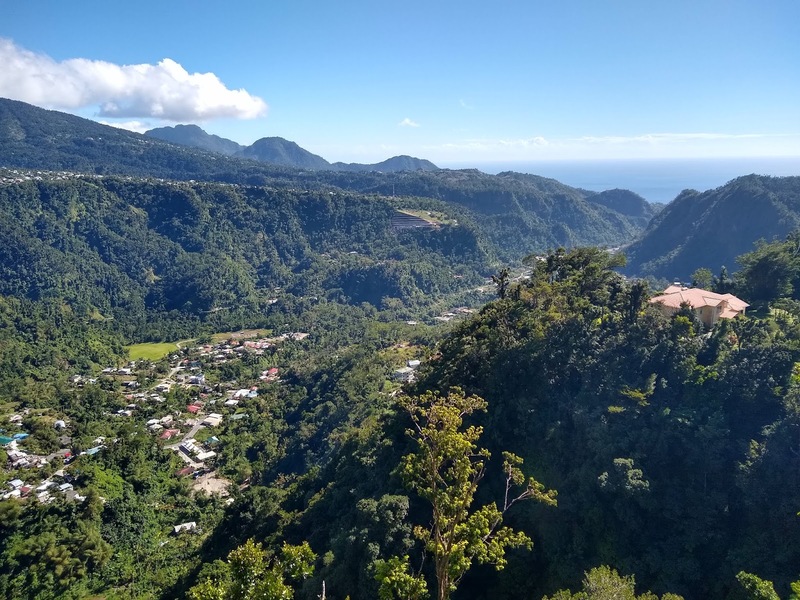 Dominica is wildly different from Guadeloupe and Martinique, the two islands it is sandwiched between. It was always one of the poorest islands in the Caribbean, now even moreso after being devastated by Hurricane Maria. The aftereffects are even more noticeable here than in the BVI or the French side of St. Martin. The lush jungle, once the crowning glory of "The Nature Island," is still partially denuded. It's going to take years for this island and its inhabitants to recover, and even when they do I suspect the towns will still be ugly and trash-strewn, packs of skinny dogs will still roam the beaches and get kicked by drunken local teens, and unlocked dinghies will still rapidly disappear. As you can tell, Dominica isn't always the easiest place to love - but after 11 days we did end up loving it, quite a lot actually. So did our 16-year old nephew Dylan who joined us here. 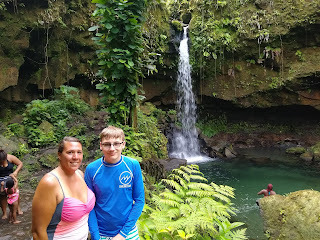 There is so much really cool stuff to see and do here, especially if you love wild beauty and outdoors activities (if I listed everything we did, this already long paragraph would be twice as lengthy), and the locals, whatever their faults, are generally the friendliest and most welcoming we've met since Saba (though Antiguans aren't far behind). Dylan drove the boat for a good portion of our crossing from Roseau to St. Pierre, Martinique, which was a slightly close reach but in far more comfortable conditions than our crossing to Dominica. Arriving in Martinique after being in Dominica was slightly shocking. Everything was so neat, so clean, so chic...so frenchy. 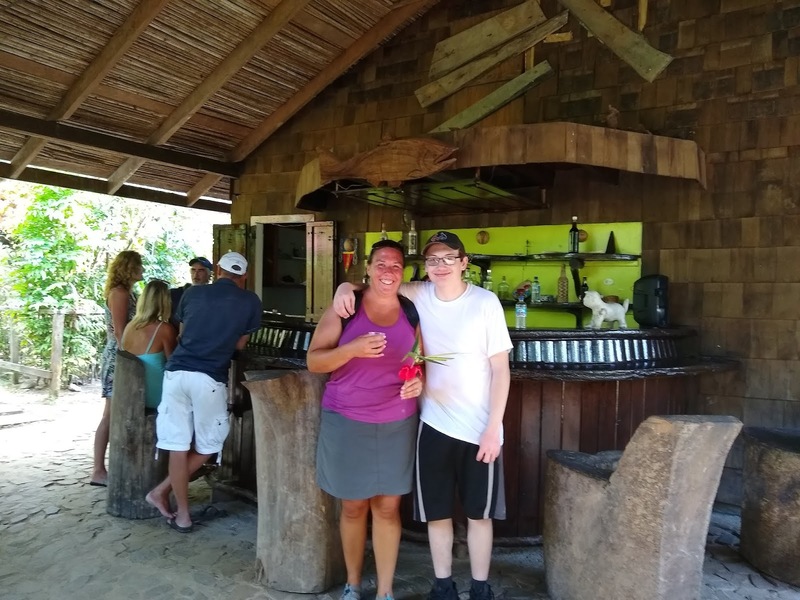 We enjoyed exploring the ruins from Mt Pelee's 1902 eruption, visiting the zoo/botanical garden, sampling distinctive agricole rum at the Depaz Distillerie, and snorkeling fantastically good coral (almost equal to Pigeon Cay) near our next anchorage at the fishing village of Case-Pilote. Dylan and I even heard whale song underwater - how cool is that!? In the surprisingly big and surprisingly nice city of Fort-de-France we met back up with our friends Jim, Lisa, and Sarah on S/V Into the Blue - since meeting them in St. Martin we'd hung out in Antigua, Guadeloupe and Dominica. We and they managed to snag a rare English-language tour of the massive fort from which the city derives its name. The next morning a very crestfallen Dylan had to fly back north to cold and snow and school, and we sailed south to Grande Anse, a sundrenched beach bum town whose beautiful bay has good snorkeling. The village of Saint Anne, our final stop in Martinique, took a lengthy beat to reach, but is a very attractive little seaside village. There are a shocking number of boats in the anchorage, but it's pretty huge and accommodated everyone without crowding. We spent a final night with Into the Blue and said goodbye, as they're headed back north after this. Saint Anne also marked the most easterly longitude that we will reach with Windbird, on this trip at least. And that brings us up to a few days ago, March 19th, when we sailed on a gloriously easy, comfortable beam-to-broad reach (finally!) to St. Lucia. We were prepared to skip right through St. Lucia considering the tales we heard of dinghy thefts and petty crime and pushy boat boys, but now that we're here we see this island's charm too. 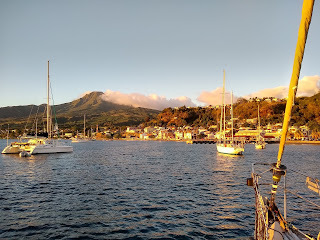 We just took a dock at Rodney Bay Marina today and I fly out for a trip tomorrow, but when I get back we'll have another five or six days to enjoy Marigot Bay and Souffriere and the Pitons before crossing to St. Vincent and the Grenadines. This season had a slow start with the repower project, but it's been a hell of a lot of fun ever since. 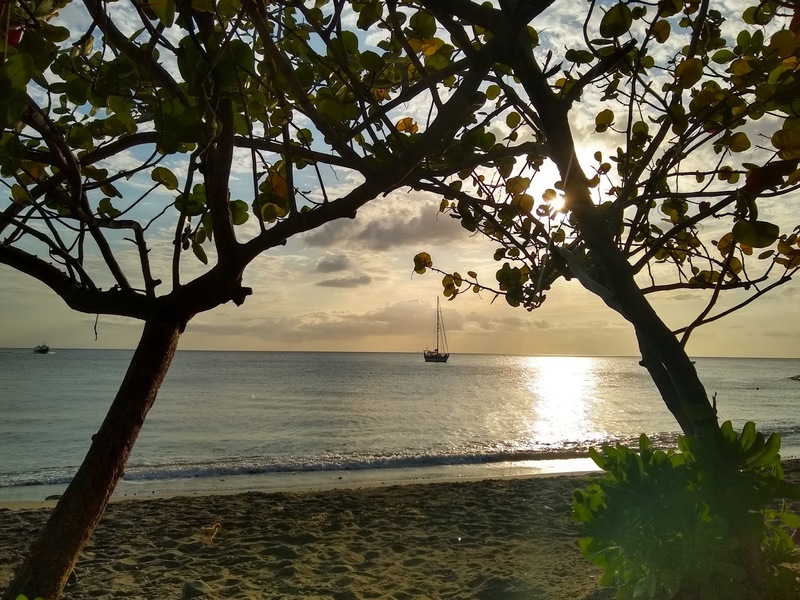 It's hard to believe there's only six weeks left before we leave the boat in Grenada; we're determined to get the most out of every day between now and then. Yikes, the blog is getting pretty seriously behind. 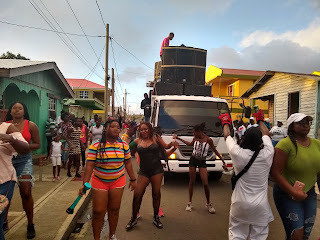 We're actually in Dominica and it's March, and here I am writing a post about St Maarten and late January. 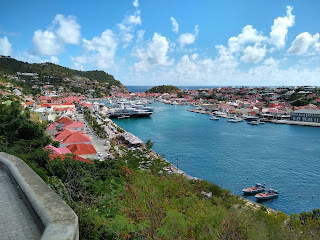 I'll make this a quick one because it frankly wasn't all that interesting; we've been enjoying our cruising since SXM much more (so much I rarely have time to write!). 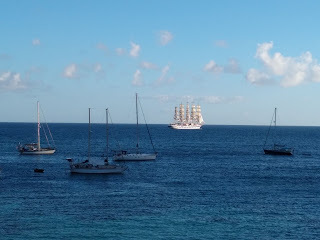 When sailing back from Statia, we initially anchored in Simpson Bay but sandwiched ourselves into a a pretty tight spot at the head of the fleet to get out of the incessant roll from passing boats. It wasn't a very good place to leave Dawn while I left to fly my trip, so the next day we waited for the 3pm bridge opening and then motored into the lagoon. We selected a very good spot with rock solid holding just south of the causeway bridge, and that was our home for the next week and a half. Before I left on my work trip, one of my "to do" items that never got done was to verify that our second propane tank was full, as we knew the first one would run out soon. I thought it was full because I remembered getting it filled in Carolina, Puerto Rico, at the end of last season. We did indeed get our tanks filled in Carolina, but it was actually during our first pass through Puerto Rico, in late March. So when Dawn ran out of propane the very same day I flew to Atlanta, she very quickly discovered that the second propane cylinder was also empty. Whoops. 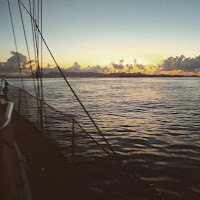 Complicating matters, our anchorage was beyond the range of any useful wifi, and Dawn normally relied in the 4G hotspot of my Google Fi phone - the one I took with on my trip. So she was left with no way to communicate with me while I was in Atlanta and then Rio de Janiero, other than to use the wifi at Lagoonies or Dinghy Dock once a day. Nevertheless she was able to get the propane filled in my absence, as she remembered hearing that Island Water World in Cole Bay accepted propane tanks for refilling on Mondays. She was also able to disconnect and reconnect the propane cylinder from its boat plumbing even though that's always been my job. Good girl. I felt bad about leaving her in a lurch - and without easy communication at that. I discovered that Google Fi offers free data-only SIMs that would allow Dawn to have her own internet via my Google Fi plan, independent of my phone, so we ordered one of those; she got it in mid-February and has worked very well. We never actually made it to Grand Case or Philipsburg or anywhere that was much beyond walking distance from the lagoon, though we had every intention of doing so. The few days that we had the time, the weather sucked or a cruiser friend came into port or I got suckered into waiting for the machinist to visit the boat to draw up plans for our alternator bracket. Spoiler alert: he got busy and kept delaying making it until the very end and then said he wouldn't be able to build it for us, it was basically a big wild goose chase and a fair waste of our time in St Maarten. Instead we had it fabricated in Antigua in a few days; I haven't installed the second alternator just yet but will do so shortly. The one thing that came together in St Maarten in a very nice way was the arrival and installation of our new MaxProp 4-blade feathering propeller. Simply unpacking it was almost enough to make me weep tears of joy, for the assembly is an exquisitely beautiful (and exquisitely expensive) piece of modern sculpture in bronze. Even Dawn admitted it was quite gorgeous. And then we had Jacque of Atlantic Divers install it, and took it for a sea trial within the flat confines of the lagoon. Wow, what a game-changer! It is absolutely perfect for our engine, with exactly the right pitch and power and zero of the vibration issues of the gifted 3-blade, and 1-2 knot gains in speed under power over the old 2-blade. The difference in reverse is particularly startling. With the old prop, 2000 rpm in reverse resulted in a lot of prop walk and a lengthy wait for any rearward progress. With the MaxProp at even 1500 rpm in reverse, water boils up as you get immediate pull and are up to a knot in no time, at which point the rudder starts to become effective. It makes Windbird a heck of a lot easier to handle in a marina (we've taken a fuel dock and a customs dock since). In real world conditions, I've become an even bigger fan of the MaxProp's performance. Motoring or motorsailing, we punch through chop far better than the old prop ever did, and the decrease in drag while sailing has been extremely noticeable, especially in light air. 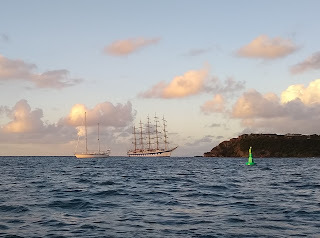 We sailed in as little as 6.5 knots of wind on our St Barts - Antigua passage and still made 4 knots. That usually took 8 or 9 knots before. Ten knots on the beam now gives us close to 6 through the water, which is about a knot faster than before. In heavy air the difference in speed is negligible, but I do feel like the boat does better bashing to windward in a seaway, perhaps because she's quicker to accelerate after colliding with bigger waves. Long story short, our $3800 piece of art was a great investment. Our last move in the lagoon was to motor over to the Island Water World marina and top up on diesel, dinghy gasoline and water. This was our first chance to verify the new engine's fuel consumption, which is right around .7 gallons per hour. This was before installation of the new prop (at which point we reduced our normal cruising RPM to 2000, which nets nearly 6 knots), but also before installation of the second alternator. So a real apples-to-apples comparison will have to wait. 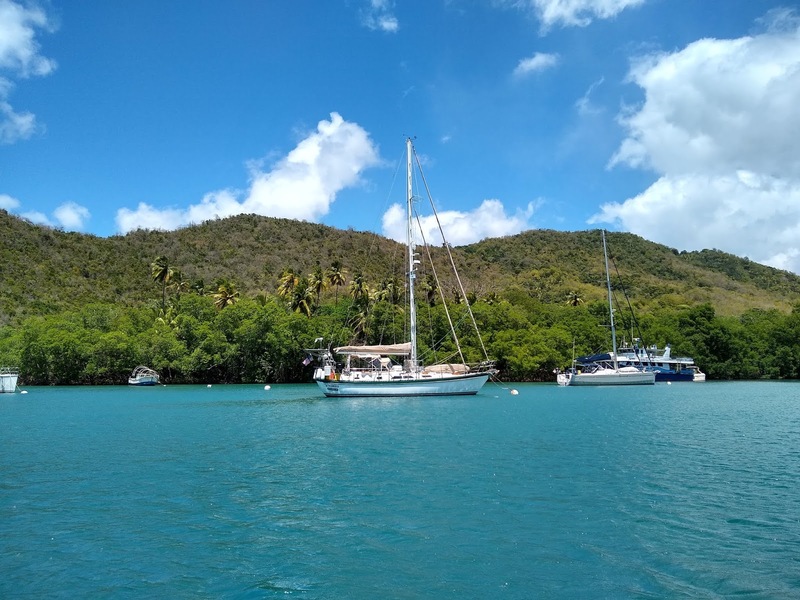 We exited the lagoon at the 4pm bridge opening on Feb 2nd, and anchored on the far north of Simpson Bay, which doesn't get swell with NE seas (it does in SE) and is fairly removed from the boat wakes. We were just waiting for my parents to fly in Feb 3rd, and then begin our cruise with them to St. Barth and Antigua. 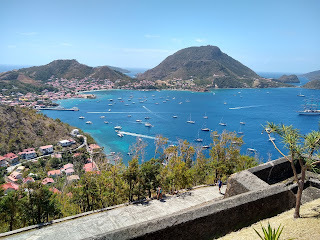 From a distance, Sint Eustatius looks like two islands: an obvious volcano rising vertiginously from the sea ("The Quill"), and a series of low hills a few miles northwest. 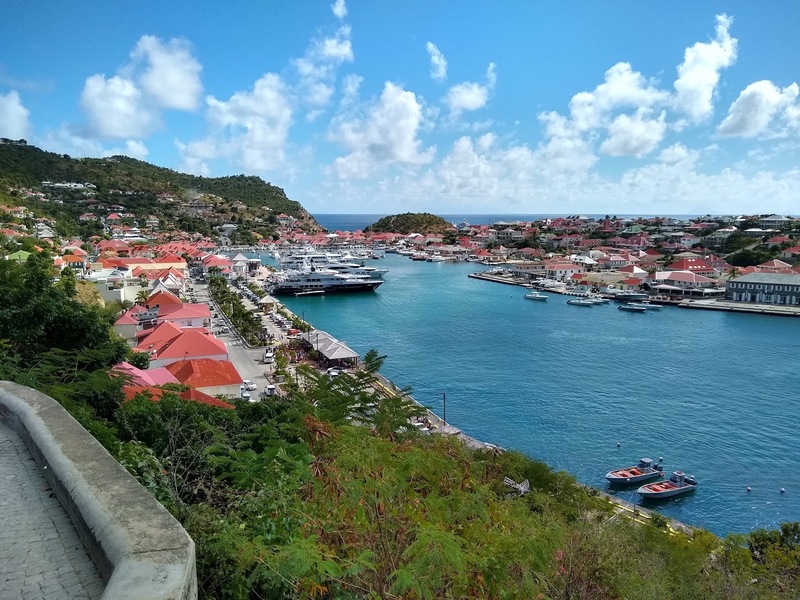 Connecting these two points is the lowland that contains the small island's only town, Oranjestad, and a whole lot of rich history. 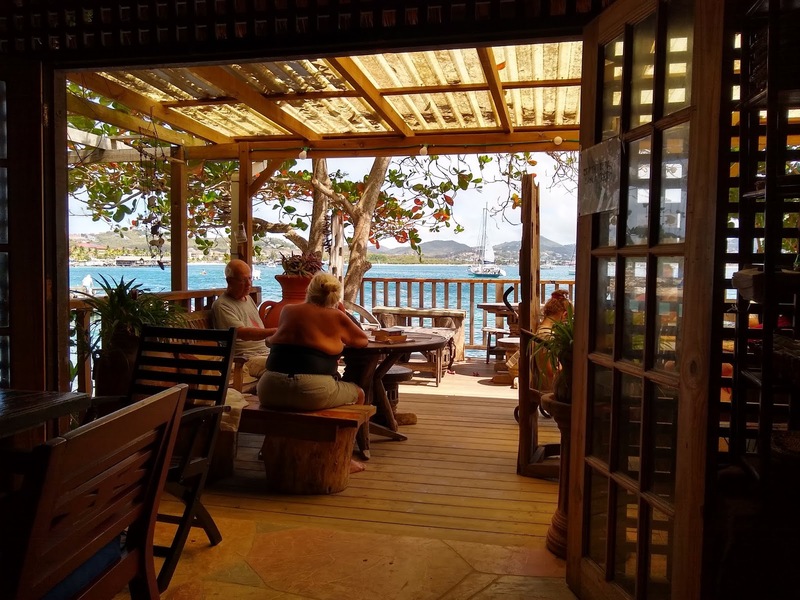 Statia (as the island is universally known to locals and tourists alike) is currently a special municipality of the Netherlands, just like its sister Saba twenty miles to the northwest, but has changed hands no fewer than 21 times during its eventful history. 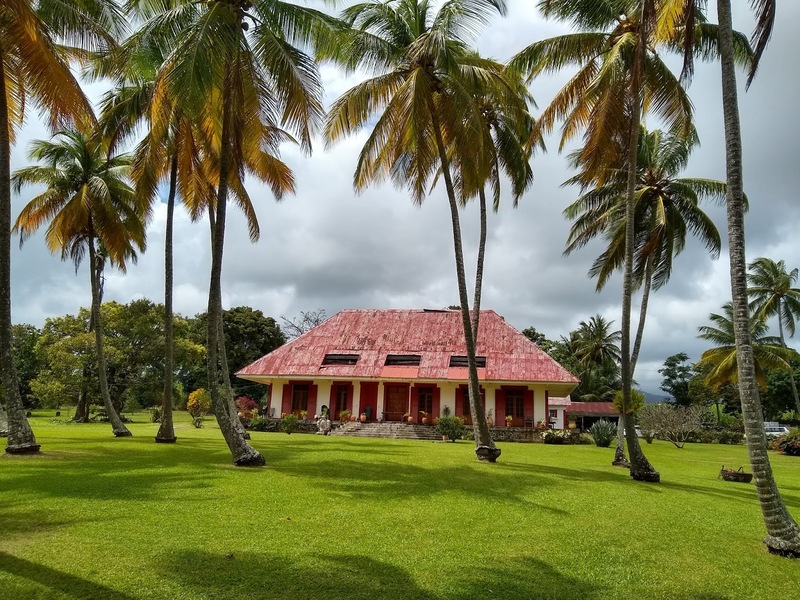 In 1636 it was colonized by the Dutch West India Company and for over a hundred years was a relatively quiet backwater where slaves grew sugarcane and tobacco on a patchwork of small plantations. In the mid-1700s, though, it was made a free port and quickly became one of the great trading centers of the Caribbean, supporting a wealthy and cosmopolitan merchant class (including a strong Jewish community). For a time it was known as "The Golden Rock." 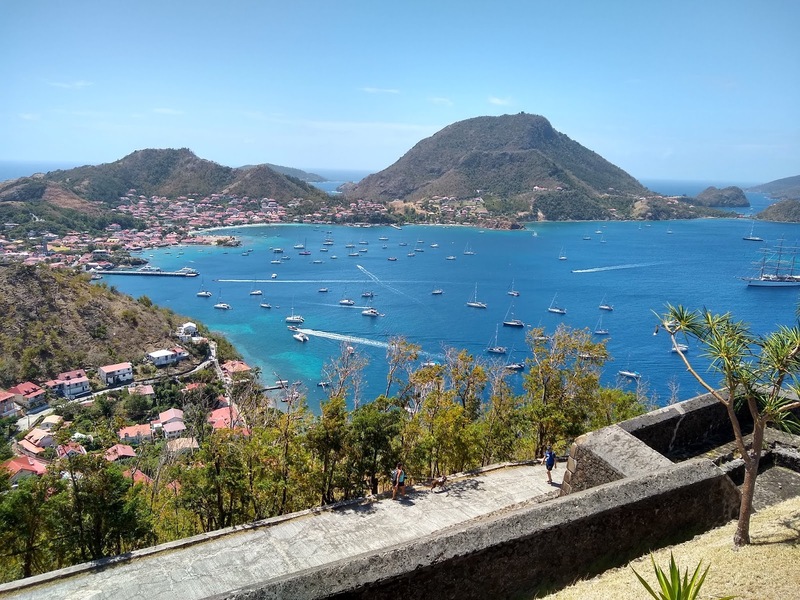 Statia has a bit of a special relationship with the US as its government was the very first to recognize the nascent United States of America, albeit in a somewhat off-the-cuff way that eventually proved to be its undoing. In 1776 you could buy damn near anything on Statia, including military arms, which is why the American brig Andrew Doria showed up in Orangestad harbor on November 16, 1776. They fired a 13-gun salute for the garrison of Fort Oranje. Governor Johannes de Graff ordered that an 11-gun salute be made in reply (which per established protocol was recognition of a sovereign flag), and the arms trading was on. Eventually the colonies obtained fully half of their supplies through the island, and it was also a critical transit point for communications with our French allies. Britain took a very dim view of this which was one of the reasons they declared war on the Netherlands in 1780 and sacked Statia in 1781. The French and then the Dutch recaptured it within a few years but the damage was done; trade moved on to other islands and Statia became a backwater once more. From an 18th century peak of 10,000 souls, the population fell to under 1000; now it's almost 4000. 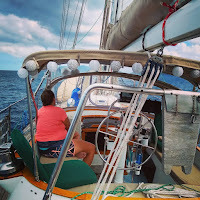 None of this history is readily apparent when you sail into Oranjestad's open, rolly roadstead harbor, but it quickly becomes clearer upon inspection. 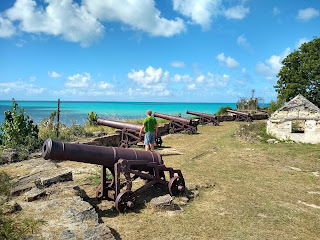 Fort Oranje has been beautifully restored and dominates the harbor from atop a 120 foot cliff, its cannons trained out to sea. Many original buildings and streets surround it for several blocks, and even the modern town is pockmarked by quite a few ruins. A cobbled slave road leads down the cliffs to the waterfront, where the majority of the warehouses originally stood. Only a few survive; the shoreline itself (which the Dutch, rather typically, expanded outwards a couple hundred feet to accommodate more warehouses) has been reclaimed by the sea over a couple centuries of hurricanes. Two warehouses have been restored, several partial ruins are still standing, and there are a great many foundations, cisterns, and building blocks visible at the shoreline and under the water just offshore. In fact, snorkeling the Orangestad coastline is like going on an archeological expedition. 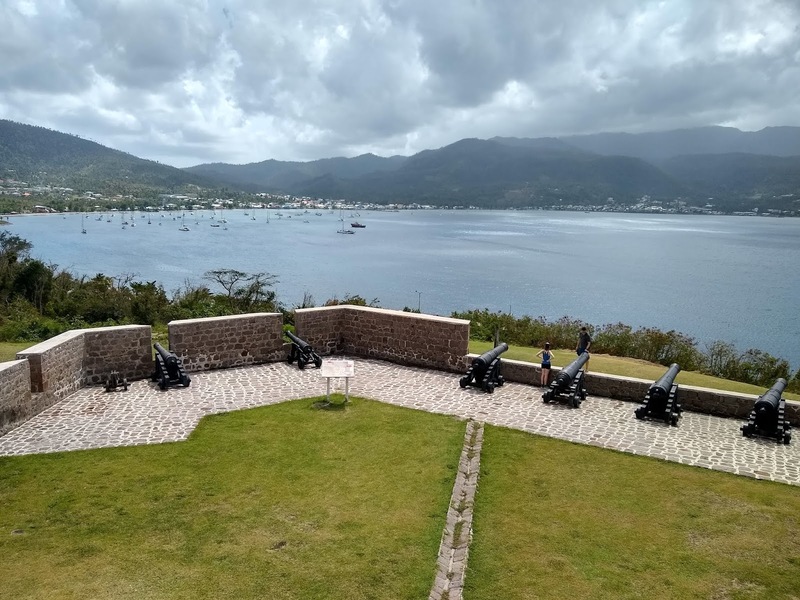 There are quite a few cannons, old anchors, ancient iron ship ribs, and other reminders of Statia's nautical past along with the remains of her once-famed warehouses. 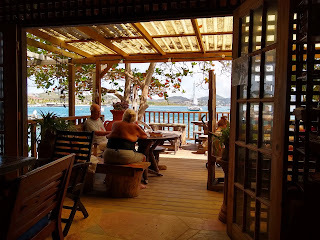 We found Statia to be a very quiet, friendly and unpretentious island. It lacks the rugged splendor of Saba, and has even less tourism. We arrived on a Saturday and found that almost everything is closed on weekends. Like Saba, there's little crime; most everyone leaves cars, homes, and dinghies unlocked. There is wonderful hiking up, around, and into the crater of The Quill. The water is clear and the diving reportedly good. The friendly customs and immigration ladies were open later than advertised on Saturday and actually reopened their office to get us checked in. The forms and procedures were basically identical to Saba, except that there is a $35 port authority fee (which I paid on Monday as the office is closed weekends). In addition, the National Parks office charges $10/day or $30/week to anchor. This theoretically includes wifi and a mooring ball, but neither actually exists. Hiking on The Quill adds $10/person for an annual permit. So our quick 3-night visit costed $85. At least the wind was moderate and well out of the northeast so we had good sleep; when it pipes up from straight E or goes SE, the anchorage is known to get horrifically rolly. After checking in on Saturday, we walked down the waterfront road and found a cool little waterfront shop and snack bar in a restored warehouse; we bought some Dutch cheese and crackers and La Trappe beers and enjoyed the sunny afternoon on their deck with Piper. That's where we met Judith, a Dutch girl who is living on Statia for a year working in special education. We got to talking & found that Judith has traveled quite a lot and lived in some really interesting places; we invited her out to the boat for sundowners and fish tacos. The next day, we all went hiking up The Quill and down into the crater, which houses a fantastic little micro-rainforest. Judith worked on Monday but that evening we got together at the excellent Boardwalk Cafe, which is closed weekends but is conveniently located right at the dinghy dock. The delicious specialty: very local goat burgers, made from the same sure-footed trash-eaters that have taken over the hillside. Other than our time with Judith, we walked around the old town, explored the well-restored Fort Oranje, perused the excellent little history museum (housed in a handsome 18th-century dwelling), took shelter from an afternoon deluge in a friendly snack bar, snorkeled the waterfront, and did some basic provisioning. It was a pretty chill visit; we were glad we came. Still, a big north swell coming in Wednesday was looking like it could make the anchorage miserable, so I cleared us out with customs on Monday afternoon and we picked up anchor for the sail back to Sint Maarten early Tuesday morning. My phone recently took a dunking, in about 3" of rainwater in our dinghy. So we may not have many photos for a while, until (and if) I recover photos from the memory. On Tues Jan 15th, Jacque from Atlantic Divers came to Windbird to install the 19x13 3-bladed prop we'd been gifted by Howard on Safara. 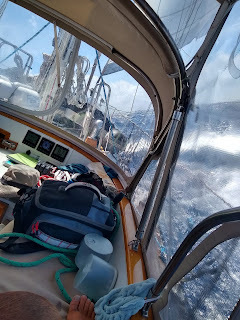 Afterward we pulled up anchor and did a quick sea trial, which revealed that there's some significant vibration above 2100 rpm and a strange harmonic hum from 1400 to 1800 rpm. We decided to continue to Saba as planned anyway, at 2000 RPM, which still gave us about 5.5 knots. For a while we were able to pure sail but then the wind died to around 10 knots on the beam. That's usually good for 5 knots of boat speed, but the increased drag of the new prop was so pronounced that we only saw 4 knots, at which point I decided to motorsail in the interest of getting to Saba before customs closed. From St. Maarten, Saba looks like an enormous rock sticking out of the water 24 miles south. As you approach, this foreboding impression doesn't change much. The tiny redroofed cottages clinging to the sides seem dangerously out of place, like the Far Side cartoon where the airline pilot wonders "What's a mountain goat doing up here in these clouds?" The base of the island is ringed by particularly steep, dry and crumbling 500' cliffs, with the open sea crashing at their bases. The lee anchorage is basically an open roadstead, fairly rolly and choppy even in relatively calm conditions and completely untenable with a big north swell. Most of it is too deep for most yachts to anchor, so the national park has installed (currently) 5 yellow mooring balls between Ladder and Wells Bays. There used to be ten, which doesn't speak highly of their strength in nasty conditions; at 60' of depth and with a dearth of recent free-diving, I didn't have the lung capacity to inspect all of ours. The sole consolation was that if it broke, we'd be blown out to sea rather than dashed on the rocks. Assuming we were on board at the time, that is. That said, we had a pretty good window to visit Saba: 10-15 knots out of the east, small north swell trending northeast. We rolled all four nights we were there, quite uncomfortably for two of them, but that's just the price you pay to take your boat to Saba. We were tied to our mooring by 4:30pm; we launched the dinghy from our foredeck, lowered our Yamaha Enduro 2-stroke with the outboard crane, and headed to shore. There is only one place that is practical to land the dinghy under most conditions: the small harbor at Fort Bay. This was about a mile and a half from our mooring ball, maybe two miles from the northernmost one. Most of it is in the lee of the island, but once you turn the corner at Tent Bay it can get pretty windy, choppy and wet. The harbor provides excellent protection, though, and there is plenty of space for visiting as well as local dinghies. One thing I noticed immediately: nobody locks their dinghies here. And apparently, not their cars or their front doors either. Crime is very low, a rarity in the Caribbean. Customs and immigration was still open when we got there at 5pm, and checking in was a fairly simple process though both forms you fill out are somewhat long. 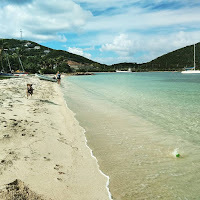 They didn't ask about Piper; we were still using the health certificate from Puerto Rico in November, which the BVI had indicated they'd still accept if we'd chosen to stop at the BVI before crossing to St. Martin. There were no customs charges inbound or outbound. Normally after checking in you'd visit the National Park office (also in Fort Bay) to register your yacht and pay fees, but as they were closed I did it the next morning. There are two fees: $3/person/week for the marine park and $1/person/day for the land park. All in all our four night stay came to $14, which I thought super reasonable. Note that the $10 hiking tag is no longer required, it is covered by your $1/day. There's not a ton at Fort Bay, though a little more than I expected: two dive shops (third is expected to reopen in a few months), customs & immigration, some well-kept restrooms, a bit of light industry, the island's only gas station, and two bar-restaurants. We visited the second of these, a fisherman's bar atop the currently closed Saba Deep dive shop, several times during our stay. It's a really cool place with cheap beer, good food, and a great local atmosphere. They often have extra fresh fish you can buy at a reasonable price, we got 2+ pounds of super good Wahoo for $20 (our own fishing hasn't been very productive lately. Doesn't help my lures are getting fouled by Sargassum seaweed every two minutes). On Wednesday morning I paid our park fees and the attendant called a taxi for us. 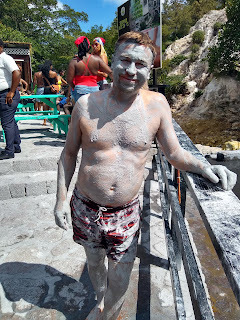 Rodney was a very friendly South African who has been living on Saba for 12 years; his Dutch wife runs the Bizzy B bakery & deli up in Windwardside. He didn't have time to give us the full island tour that morning since the ferry was coming in, but that worked out perfect since we wanted to hike Mount Scenery. After showing us around the quaint villages of The Bottom and St. John, Rodney dropped us at the trailhead just as you enter Windwardside. The trail was immaculately kept but steep; it was a good 2-hour slog up 1000-some steps and 1600 vertical feet to the summit. We really lucked out on weather. It was cool and shady during most of our climb, the clouds parted just before we reached the top, we had stupendous views out over the island (and to St Maarten, St Barts, Statia, St Kitts, and Nevis), and then shortly after we left the clouds closed in again and gave us a refreshing mist for the way down. We had Piper off leash for most of the hike and he loved it, probably covering twice the distance and vertical that we did. Back in Windwardside we had lunch at the Bizzy B and walked through the cute town. What little tourism there is in Saba is largely concentrated in Windwardside, where there are a number of rental cottages. 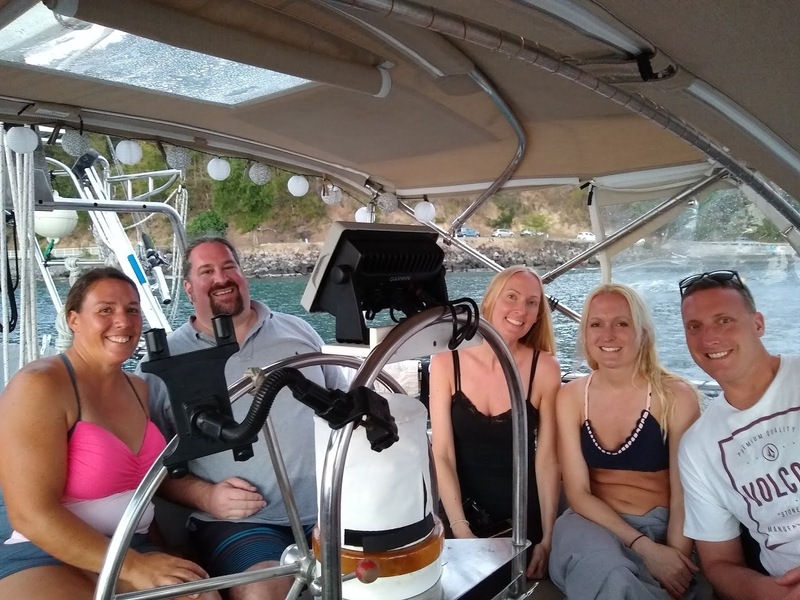 I stopped at the Sea Saba dive shop and signed up for an afternoon dive the following day; they felt that due to my inexperience (10 dives logged) and relative lack of currency (last May) I should just do a single fairly shallow dive and see how things went. It ran $65 plus $10 for equipment rental, $4 for national park fee, and 4% tax. At 3pm Rodney picked us back up and we finished driving around the island. Overall we were quite impressed at how neat and tidy everything is and how friendly the locals are. It's a really cool place. If we were staying longer, there are a ton of hiking trails, which were the only means of transport on the island until the mid-20th century. 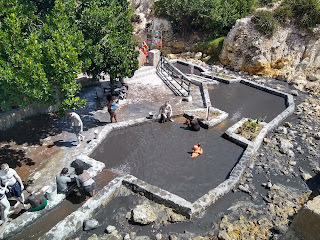 Everything arrived by ship, was landed during calm periods only at Ladder Bay, was hauled up to The Bottom via a steep set of stairs hacked out of the cliffs, and then hauled overland by porters or donkeys via the trails. Amazing. The Sabans finally took it upon themselves to build "The Road That Couldn't Be Built" between 1938 and 1958. 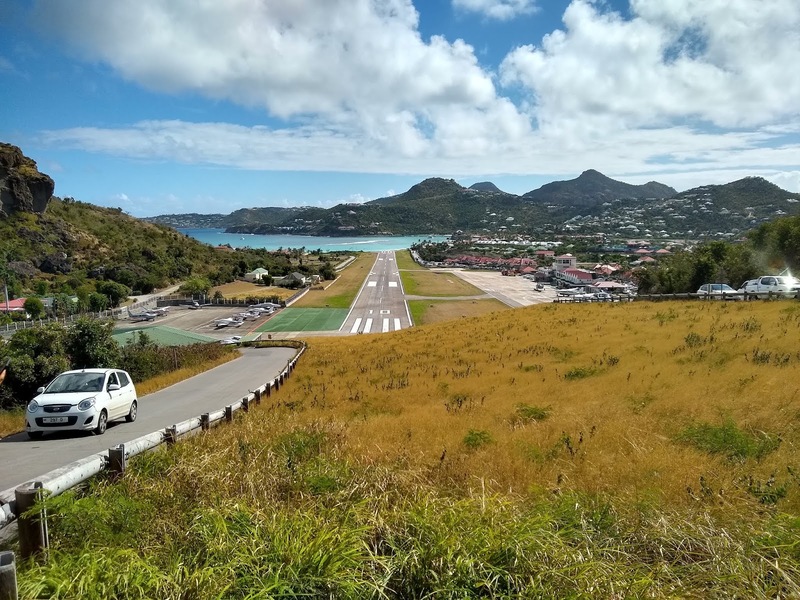 They then carved themselves an airport on the only semi-flat piece of land on the island, which opened in 1963 and currently has the distinction of being the shortest commercial runway in the world at 398 meters. The Fort Bay Harbour followed in 1972, and now Saba has both ferry and airline service connecting it with surrounding islands. My dive on Thursday was at Tent Bay Reef, on the southwestern corner of the island. I got back into the swing of diving quite easily; it's always felt pretty natural to me. The dive went to a maximum of 65 feet, but most was at 30-40 feet. There was a ridiculous amount and variety of sealife, and visibility was really good. Among other things I saw 6 or 7 blacktip sharks, huge permit almost as big as the sharks, several green turtles, and a couple octopus. The terrain included an interesting wall and a nice swimthrough. I was down for a full hour. When I got back from the dive, Dawn encouraged me to sign up for the following morning's 2-tank dive, noting that if I was going to do much diving anywhere this season, Saba should be it as it is world famous for its excellent diving. So I did, and both of those dives were as good as Tent Bay Reef. The first one of the morning was at a pinnacle known as "Twilight Zone;" it rises to 80' from a surrounding seabed of 250' depth. The fact that we could see the seabed from the top of the pinnacle and even higher gives you a good idea of how awesome the vis was. Again, there was an enormous amount and variety of sealife. Unfortunately I was breathing air (not certified for enriched nitrox, yet) which at 100' depth limited my bottom time to about 20 minutes. The second dive was at "Babylon," and while not quite as spectacular was still a pretty cool dive. After I got back, Dawn and I went snorkeling up on the north end of Wells Bay, and even that was pretty special. 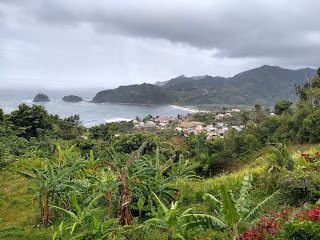 I would have liked to have spent another day in Saba to do more hiking and hanging out in The Bottom, but we wanted to also go see Statia and had a bit of a limited window before weather would force us back to St. Martin. So on Friday afternoon I checked out with customs, that night we hung out with a nice cruising couple on the Valiant 42 S/V Aleta, and the next morning we dropped our mooring to begin the 19 mile motorsail to St. Eustatia. Saint Martin, or SXM as it's popularly known due to the IATA code of its famous airport, is an island shared by two countries. The northern 60% or so is an overseas collectivity of France, which basically means it's considered part of France and participates in their elections but has a fair amount of autonomy. The southern 40%, named Sint Maarten, is formerly part of the Netherlands Antilles but since 2010 has been a constituent country of the Kingdom of the Netherlands. The difference is transparent to most travelers, who arrive at the big airport on the Dutch side, clear Dutch customs, and then go merrily about their business anywhere on the island with only road signs and a profusion of boulangeries and pâtisseries and gastronomic cafés to indicate one has crossed over to the French side. For cruisers it is not so simple. When you anchor on the French side you check in with the French, and on the Dutch side you check in with the Dutch. If you move from one side to the other, you must check out and then clear in with the new authority. Once you are anchored and checked in, though, you can freely move between the two sides on land or via dinghy. 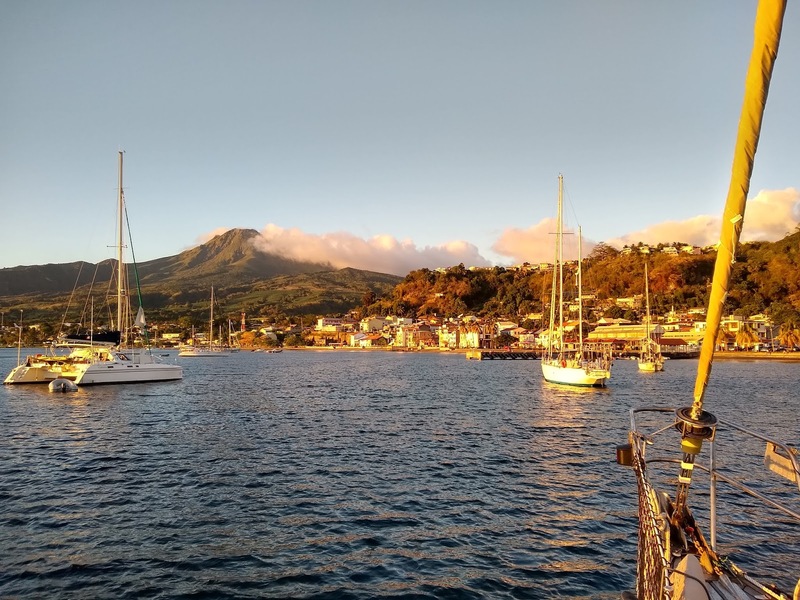 The main French anchorage of Marigot and the secondary one at Grand Case are both exposed to north swell, while the Dutch anchorages of Simpson Bay and Phillipsburg get a fair amount of wake and wraparound eastern swell. Of course for excellent protection one can anchor inside the famed Simpson Bay Lagoon, with anchorages available on both French and Dutch sides. All other things being equal, superyachts stick almost exclusively to the Dutch side and cruisers tend to gravitate toward the French side, due to the ease of clearing customs and immigration and the almost total lack of fees (or at least the French failure to collect published fees). 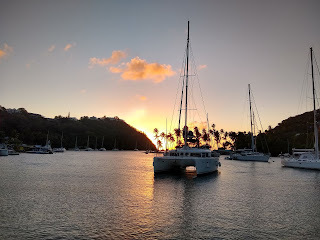 Being the cheapskates we are, plus having a dog (who the French don't care about), and myself having fond memories of Marigot from the 2014 Heineken Regatta, we decided to anchor at Marigot and check in on the French side after our crossing of the Anegada Passage on 10-11 January. 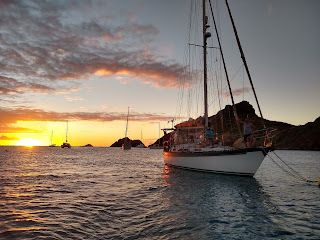 We anchored on the west end of the large fleet in Marigot Bay, which put us just about abeam the entrance to the lagoon. I dinghied to a floating dock deep in the Marigot side of the lagoon and walked a few blocks to the local Budget Marine, where I was able to clear in by computer terminal via an easy 10-minute process (including learning the French keyboard) and a $2 donation to charity. 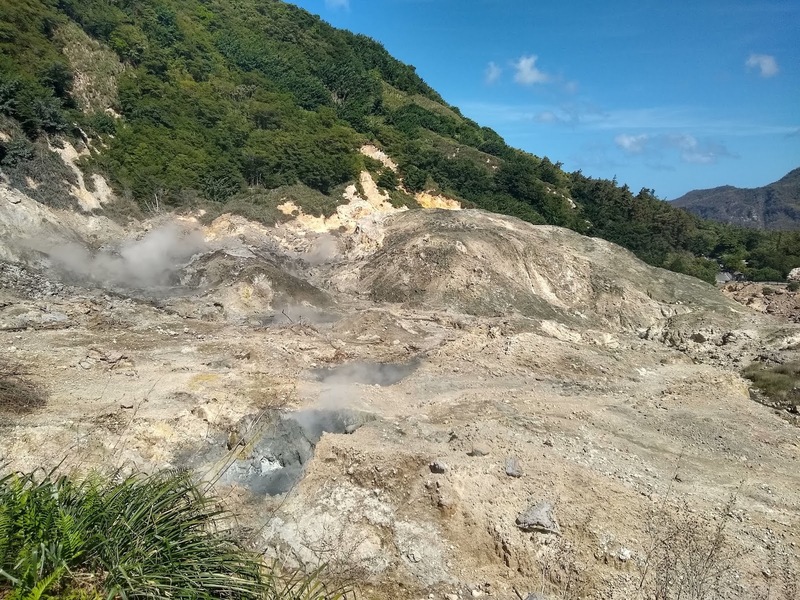 It's fantastically easy, and is the same process used further down the islands in Guadaloupe and Martinique. A walk around Marigot revealed that it was hit very hard by Irma and has a long ways to go to recover. Frankly, I didn't recognize it from five years ago. Quite a few buildings are completely destroyed with their grounds overgrown by brush; many others are damaged and have not been repaired; others are being repaired but are currently covered by scaffolding; and even of the buildings that appear to be in decent shape, many are unoccupied, their former businesses shuttered. Even the neat little waterfront promenade and market looks dirty and unkempt whereas it was formerly quite nice. It's pretty sad to see. Local liveaboards and longtime cruisers report that petty crime and dinghy theft is prevalent. I'd been inclined to believe reports of post-Irma crime on SXM were exaggerated, but perhaps not. We certainly kept the dinghy locked up tight at the dinghy dock and at night on our davits. In the lagoon on both the French and Dutch side, there is quite a lot of destruction evident in wrecked docks, half-sunk boats, and mastless derelicts. There's been an effort to find and mark submerged wrecks with small bouys, so cruisers anchoring in the lagoon don't get tangled up. Many of the wrecks are pretty obvious due to masts and other bits rising out of the water, however. On land, the Dutch side seems to have recovered much more quickly than the French. There are a lot fewer destroyed buildings and most of the pre-Irma marine and tourists businesses seem to be back to their old selves. The Dutch Simpson Bay Lagoon bridge and causeway bridge are both operating normally, though the French lagoon bridge is still out of commission. Interestingly, you only pay for a bridge opening if you check in on the Dutch side. You can go through both bridges, anchor on the French side of the lagoon, check in with the French, and pay nothing more than your $2 donation. 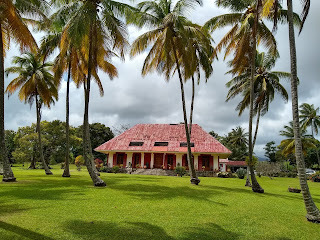 We meant to get over to Grand Case and otherwise check out the island, but ended up spending much of our time chasing down practicalities and stayed anchored in Marigot while dinghying to the Dutch lagoon side. 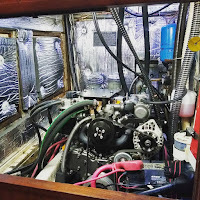 I found a machinist to fabricate a mount for our second alternator when we return to SXM this week (we're in Statia at the moment), and we had a diver put on the free 3-blade prop we got from Howard on S/V Safara. Sadly, it doesn't seem to be a good match for our boat...we're getting a weird harmonic hum at 1400-1800 RPM and rather nasty noise and vibration (cavitation?) above 2000 RPM. 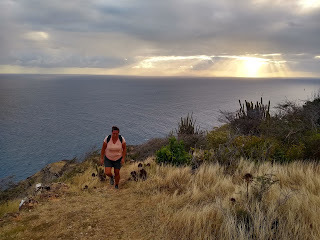 We took it to Saba and Statia and have tested it out along the way. There's a pretty big increase in drag when sailing in light air; where we formerly saw 5 knots boat speed when beam reaching in 10 kts of wind, now we get closer to 4 knots speed. We are seeing a lot better speed under power over our 2-blade prop, even in our reduced 1800-2000 rpm window, and it seems to drive the boat through chop a lot better. We've decided to bite the bullet and ordered a 4-blade feathering MaxProp propeller. It's a lot of money ($3850) but combines low drag when sailing with much better speed and driving force under power. I figure as we already spent so much money to install the perfect engine, transmission, and driveshaft, it makes sense to get the best prop we can. 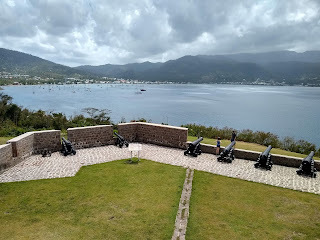 We did find time to climb Fort Louis for a nice view over Marigot Bay, enjoyed coffee and croissants at Marigot's waterfront pâtisserie, gave Piper some fantastic beach playtime, watched jets land over Maho Beach, and found the local cruiser happy hour hangout in Simpson Bay Lagoon, appropriately called Lagoonies. 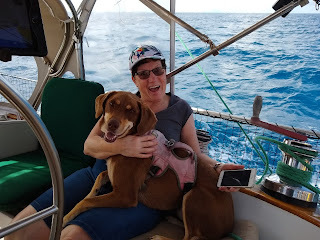 We hung out with S/V Be As You Are several times and helped them fix their roller furling, met their friends on S/V Freed Spirit, and had dinner with a nice young couple (Lara and Rick) and their lovable but rambunctious pup Roger on S/V Mai Tai. So it was a nice and productive four days on St Martin even though the sad condition of Marigot did cast a bit of a pall on things. Then we cleared out via the same quick and easy $2 computer terminal and set sail for a fantastic week in Saba and Statia - I'll save that for the next post. Tomorrow we're sailing back to SXM ahead of a week of high winds and big north swell, but will be checking into the Dutch side and probably going into the lagoon at some point. Besides the practical boat stuff (2nd alternator, MaxProp, engine 50 hour service), we hope to rent some scooters and check out the rest of the island for a day. Repower is Finished - On with Cruising! To nobody's surprise at all, the repower took a couple weeks longer than expected. This was mainly due to our decision to replace the old two-piece drive/prop shaft with a single piece, only to discover that it could not be machined in St. Thomas but was instead manufactured and shipped from Ft. Lauderdale. This was happening right around the holidays, which I think interfered a bit, and then shipping (via USPS) was a mess - it actually got returned to Florida, then mailed again to St. Thomas. The result was that we didn't actually get the shaft until just after the New Year. Meanwhile we sat on the dock at $67 a night, which was frustrating. We launched the dinghy and used it to run Piper around the corner to Vessup Beach, which was a nice cruising-like break from the dock. I picked up a 9-day double Rio trip over Christmas (gotta pay for all this shiny new machinery!) while Dawn flew north to be with family. Back on the boat, we worked on miscellaneous projects like servicing our winches and recaulking our teak deck, and then celebrated a nice, fairly low-key New Years Eve in Redhook, staying up until nearly 3am. The shaft, new engine and transmission went into the boat on Friday, Jan 4th, about as easy as the old one came out although Kevin did have to take a few more things off of the new engine. We were told fairly late that our second alternator's brackets wouldn't work with the new engine, and not wanting to spend more time in St. Thomas to have a new bracket machined, I chose to install a battery switch to allow the 120A alternator that came with the engine charge either the engine or house batteries (and also allow either bank to start the engine). We do want to keep the redundancy of a second alternator, but this setup buys us some time to get the new installation right. Solar and wind are doing a pretty good job of keeping up with our usage, but it would be pretty disconcerting to head out cruising with no other means of charging your house bank. After the engine was physically in the boat on Jan 4th, I had to head to the airport to fly to Atlanta, where I had my 9-month recurrent training on Saturday and Sunday. Kevin did more of the installation on Saturday but not everything was done, so he finished up Monday morning, at which point I was back. By Monday afternoon we'd started the engine for the first time - a very exciting moment - but it was too late for sea trials, so we did those Tuesday morning. The engine ran very well, but it was obvious we're pretty underpropped with the new engine. I think we were with the old one too, but now it's especially bad. Other Tayana 42 owners with 53-57 hp engines get about 6-6.5 knotsin flat water at 2400 rpm; our old engine gave us 5.5 on a good day; with this one we're getting 4.8. It's only an 18-inch 2-bladed prop with (I'm guessing, there's no stamp) around a 12-14 inch pitch, which is quite small. Kevin advised us we should repitch or get a large prop as soon as possible, and we decided to do so in St. Martin, where the marine facilities and services are considerably more abundant than St. Thomas. We left the dock at American Yacht Harbor for good at 11am Tuesday with a terribly embarrassing incident, our first ever docking disaster. With a narrow fairway to maneuver in and a brisk crosswind piping up, a miscommunication between Dawn and I plus a misjudgement on my part led me to try to turn out before I had room to clear our rather large neighbor, M/V Tabula Rasa, whose bow was sticking well out into the fairway. We ended up getting blown into her huge anchor, which neatly inserted itself between our forward lower starboard shroud and upper starboard shrouds. The owner and a bystander came running to help, along with two cruisers on small dinghies, and between all of us we were able to extricate the rig from the anchor's clutch and push Windbird clear. We circled back to the T-head to apologize and make sure there wasn't any damage; thankfully both boats escaped without harm (well, we slightly bent one of our stanchions). It was a couple of really tense minutes and could have been a lot worse, and it left us feeling a bit shaken all day, definitely taking away from some of the glorious triumph of escaping Red Hook with a brand new engine. 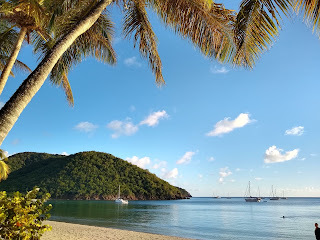 We motored to Maho Bay, our favorite anchorage on St. John, where we swam with turtles and I gave Windbird's bottom a good scrub with my snuba rig (it was surprisingly clean for 2 months in marinas, so unfortunately the scrub didn't improve our speed much). Piper got in some good beach play time once the beachgoers went home, although the sunset patrol of vicious noseeums cut short his fun. It was a lovely evening with brilliant stars, and it felt so great to be out cruising again. The next morning we sailed downwind back to Cruz Bay, where the local insurance adjuster, Marty Carlson, had asked to see the boat again. The one thing he hadn't been able to figure out, and something that had bothered me too, was just how the top end of the engine got so full of water when the bilge flooding had only reached the bottom of the rear main seal. 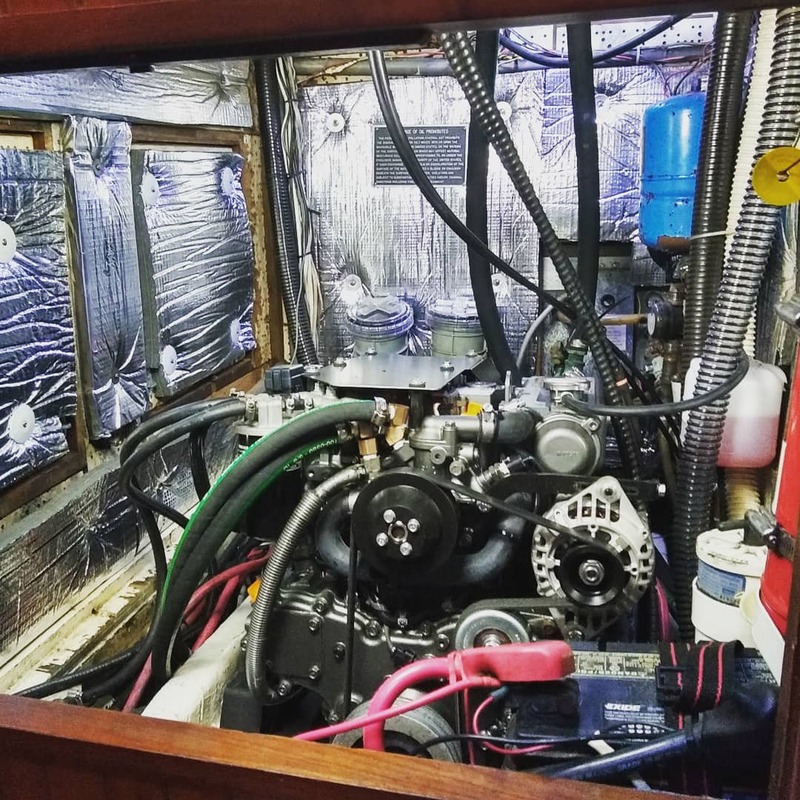 A remark from the mechanic who worked on the boat in Puerto Rico gave Marty an idea, which was quickly borne out once he inspected our cooling/exhaust system. Our raw water, after it exits the heat exchanger, goes through a vented loop above the water line before returning to the exhaust elbow. The vented loop drains into the scupper hose. Because I apparently neglected to open the scupper seacocks before we left the boat for the summer, once they filled up with water it backflowed to the vented loop, filled the water muffler (that I had drained), then came up through the exhaust and flooded the top end through one or more open exhaust valves. The boatsitters were still negligent for not bringing the cockpit flooding or bilge flooding to my attention, but my inexplicable failure to ensure the scupper seacocks were open after I exercised them (it was on my checklist, and had been crossed off) was the original disastrous mistake. It remains to be seen how our insurance is going to handle this. 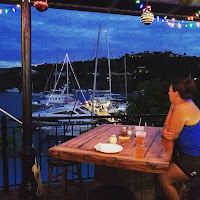 After Marty inspected the boat, we motorsailed around the south side of St. John to Lameshur Bay, our 2nd-most favorite anchorage in St. John. I enjoyed some spectacular snorkeling around the point there, and it was another beautiful night with only one other boat around. The next day, Thursday Feb 10th, we were off the mooring at 11am and headed ESE to St. Martin, 95 miles away. 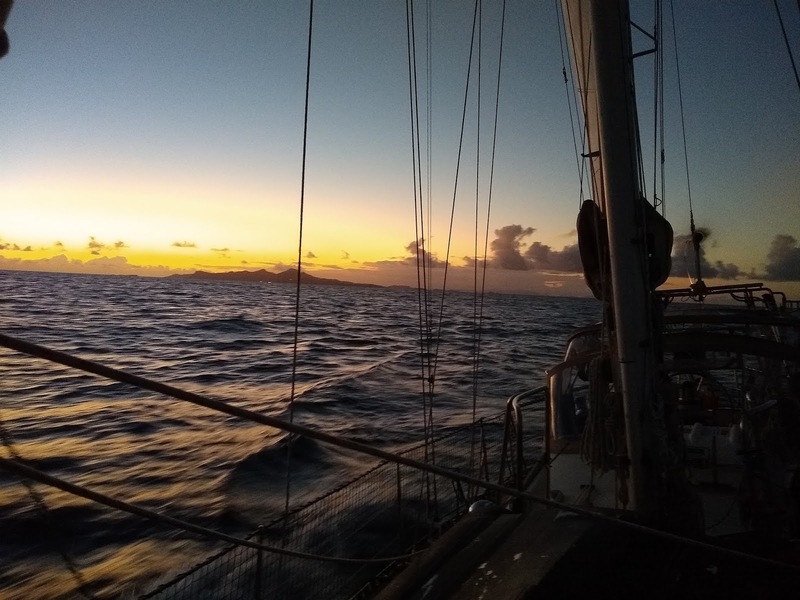 We had a great weather window for motorsailing across the notoriously rough Anegada Passage (which wags call the "Anegada Pukeage"). It was a little slow and choppy at first, but soon the wind went almost directly south and quite light, and the seas settled down and our speed crept up. We crossed in quite a lot of company, for many cruisers had been holed up in the Virgins waiting for the Christmas Winds to break. While we were about 15 miles out, our friends John and Belinda on S/V Be As You Are radioed back that there were several lobster pots in 100 feet of water just after crossing the dropoff while approaching St. Martin. Since I had my usual 4am-7am watch and didn't want to wake Dawn up early, I slowed down and altered course to the south to cross the shelf once there was enough light to see any lobster pots. We got into Marigot Bay at 7:20am Friday and found a nice spot to anchor in 11 feet of crystal clear water over a perfect sand bottom. And that's where we are now. I'll write more about St. Martin later, but my first impression is that they got really, really hard hit by Irma and they've been a lot slower to recover than Puerto Rico, the USVI, and even the BVI. Marigot is a shell of its former charming self. Quite a few completely wrecked buildings have been left where they lay, the bush quickly overgrowing them. There are still dozens of sunken and half-sunk boats in the lagoons. It's still beautiful here and there's a lot of boat activity, and the marine industries seem to be back up to full speed (largely fueled by all the salvage and repair work, I'd guess). But I'd guess it's going to be several years yet before St. Martin fully recovers from Irma. We ran into our old pals Howard and Doris from S/V Safara here; they actually hailed us as we were pulling into Marigot. Last year we weathered the blow of the season in Mayaguana with them (and our friends on Sea Otter), and made the short crossing to Provo in their company. They quickly scooted across to the DR and it was several weeks before we saw them once again, in Luperon. After that they scooted down the chain to Grenada, and this season have been working their way back up to St. Martin where they're doing some work on the boat. Yesterday I got on the cruiser's net to inquire about a 3-bladed propeller, and Howard came back to offer a 19" x 13" specimen from his bilge, for free! I'm cleaning it up today and we'll hire a diver to put it on tomorrow, and hopefully it'll be a good match for the engine. If not, we'll have to choose between buying a new fixed-blade prop or springing for a nice MaxProp or VariProp feathering propeller. They're a lot of money and require extra maintenance but have much better power in reverse, have field adjustable pitch, and have far less drag while sailing than a traditional 3-blade prop. Our other project here is getting a new bracket fabricated for the second alternator. A machinist should be coming to the boat tomorrow, and can hopefully draw up some plans. Then it looks like we'll have good weather to head to Saba and Statia for a week before coming back to St Martin. We'll finish exploring the island, get our practical stuff wrapped up, and I'll fly out for a 4-day trip; then my parents will be flying in and we'll head out with them to St. Barth, (possibly) Montserrat, and Antigua. It's good to be out cruising again!